This document contains course notes of the course Financial Markets by Professor Robert Shiller of Yale University in the United States that is available on Coursera.org. This course explains the basics behind financial markets that are essential in understanding the financial system. According to Professor Shiller, financial markets have greatly contributed to economic development. The Dutch VOC was the first publicly traded company in 1602. It is an example of what finance does and how financial innovations can change lives. When the people in Holland discovered that they could trade VOC stock every day, it gave a sense of excitement and possibility. This led to the financing of many more corporations. The financial crisis consisted of the sub prime crisis (2007), the failure of Lehman Brothers (2008) and European Sovereign Debt Crisis (2009-2012). The ensuing Great Recession caused millions of people to lose their jobs. This caused finger pointing in the direction of the financial system. It seemed that the financial sector was to blame for this. On the other hand, the financial sector has made economic development possible. The world is going through a real revolution, which is the spread of financial capitalism all over the world. There are crises but those crises may be manageable if one understands finance. 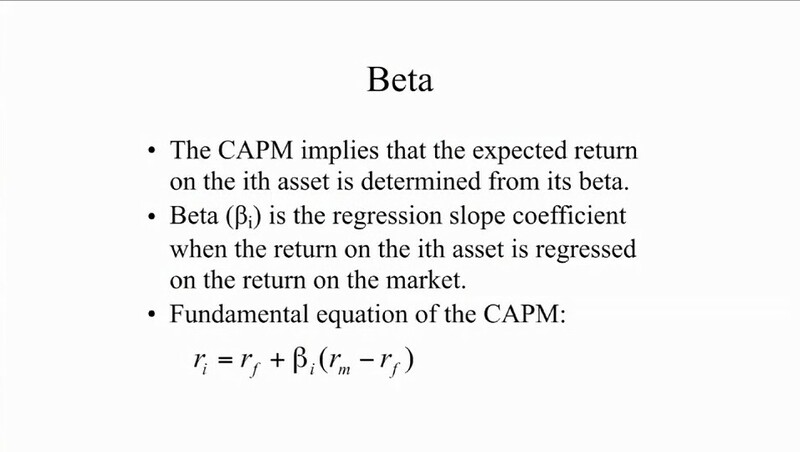 The core model of finance is the Capital Asset Pricing Model (CAPM). It explains how risk is spread, diversified and managed. It helps to understand the important concept of leverage, which can be used to increase or reduce risk exposure. It helps to understand individual investment decisions. It explains the importance of diversification. Insurance must be integrated into finance as it deals with the same issues, most notably managing risk and allowing people and organisations to achieve their goals effectively. The guest speaker is Maurice Hank Greenberg, a former CEO of AIG. Before the financial crisis AIG did very well, but during the financial crisis it failed and had to be taken over by the government. Mr. Greenberg had a vision and has set new standards for risk management. Ever since the VOC, the average returns on stocks have been high. It puzzled people for centuries why shares in companies did so well. If a higher return on a certain investment is possible, then why are there not more people enter the same business, so that the return on investment is lowered? This is called the equity premium puzzle. The average return on the United States stock market between 1871 and 2006 was 6.8% per year corrected for inflation, while short term government securities only offered 2.8% per year . The same applies to other countries as well. The extra return is a risk premium. As a consequence stocks may seem the best investment and other investments may seem irrational. Henry Markowitz had revolutionary new ideas about what was the best investment. He theorised that every rational investor, at a given level of risk, will accept only the largest expected return. This led him to develop Modern Portfolio Theory, which attempted to account for risk and expected return mathematically to help the investor find an efficient portfolio that represents the most expected return at a given amount of risk . Assume that there is only one stock, VOC with a historic average return of 20%, with a standard deviation of 40%. Standard deviation (σ) is a measure of how spread out numbers are . Assume that there is a risk free investment alternative, Dutch government bonds, that yield 5%. Assume that it is also possible to borrow at 5%. Assume that an investor has 100 guilders to invest. He could fully invest in government bonds. The return would be 5% and the standard deviation would be 0%. 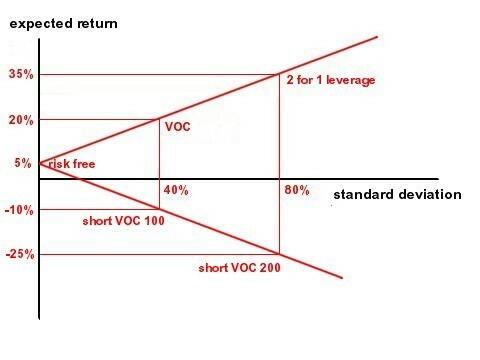 He could also fully invest in VOC with an expected return of 20% and a standard deviation of 40%. The investor may also borrow 100 guilders so he can invest 200 guilders in VOC, which is a 2 for 1 leverage. The expected return would be 35% as he has to pay interest on the loan, but the standard deviation would become 80% because he doubled his risk exposure. He could do anything in between. For example, he could invest half his money in VOC and half his money in Dutch government bonds. He could also borrow 50 guilders to invest 150 guilders in VOC. The investor may even short VOC stock. The sloped red lines in the figure below show all the investment options, with their expected returns and standard deviations. By adding more assets to the portfolio, it is often possible to bring the efficient portfolio frontier to the left, which means that the same expected returns can be achieved with less risk. As oil does not correlate very well with the stock market, but still gives good returns, the improvement in the risk/reward ratio is significant. The fundamental insight coming from this, is that more assets in the portfolio is always better. 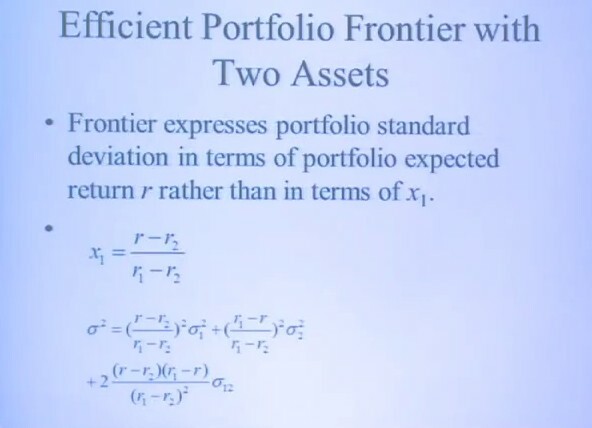 Only the portfolios on the upper part of the efficient portfolio frontier are rational investments. Intuitively, diversification is wise move. This was already known in the 19th century, but until Markowitz nobody did the math to prove it. The next step is to add a risk-free asset, for example 1 year government bonds yielding 5%, assuming that the investment horizon is 1 year. 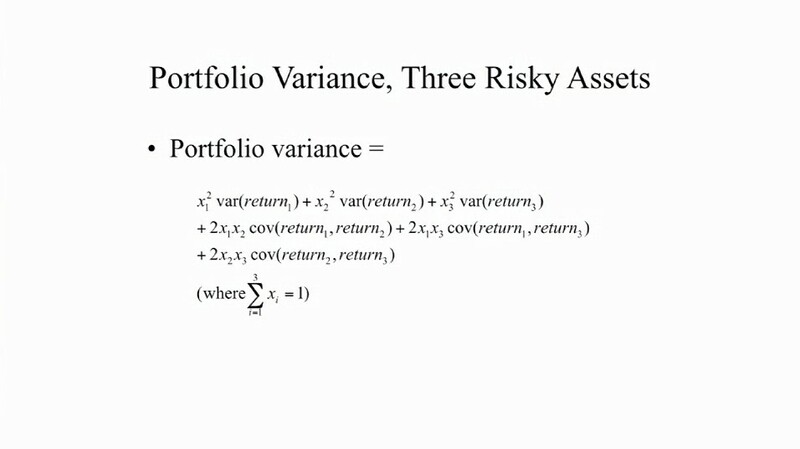 A risk-free asset has zero variance in returns (hence is risk-free). Assume that it is also possible to borrow at 5% so leverage is possible. After adding the risk-free asset, it is possible to plot a line from the risk-free return (5%) and the risk-free standard deviation (0%) that touches the efficient frontier at just one point. This point is called the tangency point, which represents a portfolio with no risk-free holdings and 100% of assets held in the portfolio occurring at the tangency point. All rational investments are now combinations of the risk free asset, combined with the tangency portfolio. They are represented in the upward sloping line, which is now the efficient portfolio frontier. They provide the best expected returns for a given amount of risk. The choice of the preferred combination depends on the risk preferences of the investor. Points on the lower left of the tangency point are combinations of the tangency portfolio and the risk-free asset. Points on the higher right of the tangency point are leveraged portfolios involving negative holdings of the risk-free asset . 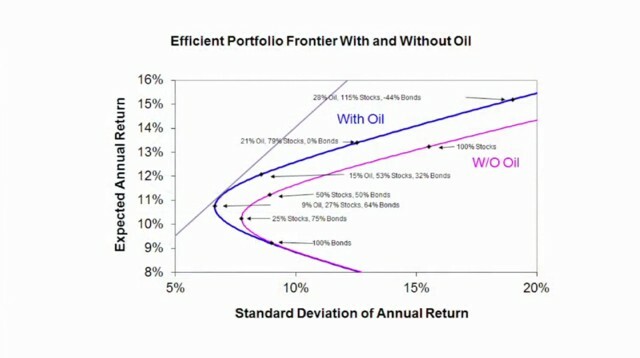 In the efficient portfolio frontier with and without oil, another form of leverage is also plotted. For example, the graph depicts a portfolio of 29% oil, 115% stocks and -44% 10 year government bonds. This example may be confusing because 10 year government bonds are a risky asset given the investment horizon of one year, while 1 year treasuries are the risk-free asset. It is however possible to short 10 year government bonds and go long stocks and oil. 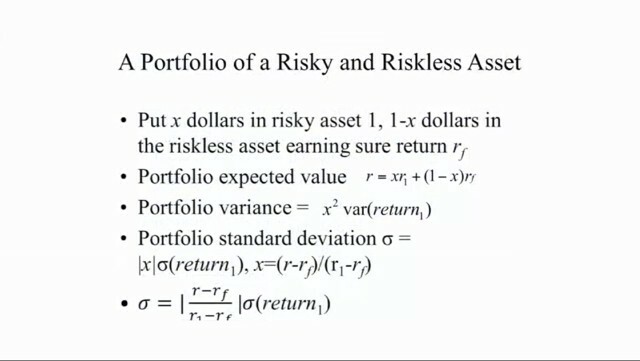 In the theory of Markowitz, the tangency portfolio is the optimal portfolio, which implies that all people should invest in the same risky assets. Their risk preferences are expressed in the amount of leverage they use. This idea is called the Mutual Fund Theorem, which implies that there needs to be only one mutual fund that invests in the tangency portfolio which provides the optimal mix of all investments. Every investor only needs a combination of the tangency portfolio and the risk-free asset. Supply and demand have to be equal so the tangency portfolio should consist of all investment assets in the world, so the market portfolio equals the tangency portfolio. As a consequence a higher Beta implies a higher expected return as the asset correlates with the market and the market is expected to have a higher return than the risk-free rate of return. If β = 1 then the return of the stock moves with the market. If β > 1, then the stock moves with the market, but in an exaggerated way. In that case investors demand an expected return that is above the expected return of the market. If 0 < β < 1 then the stock moves with the market in a muted way. If β < 0 then the stock moves opposite to the market. Because adding this stock to the market portfolio reduces risk, investors demand an expected return that is below the risk free rate. σ = (p(1 - p)/n)½. To make insurance work as an institution was a challenge. The following types of insurance exist: life insurance, health insurance, property and casualty insurance and investment related insurance. To make insurance work however, it takes a lot of detail. First insurance needs a contract design that specifies risks that are covered and risks that are not covered. There are a number of issues that are of importance. First, moral hazard is an important issue as insurance may make people change their behaviour so that the risk increases. In insurances risks are excluded that are vulnerable to moral hazard, for example suicide in a life insurance. Second, there is a selection bias or adverse selection when people that sign up for the insurance know that they have a higher risk. If insurance companies do not control selection bias then the premium may become so high that other people may refrain from taking the insurance. In insurance risks are excluded that are vulnerable to selection bias, for example dying from a hereditary disease. Third, there are legal aspects. Definitions and laws have to be clear otherwise there can be costly lawsuits. 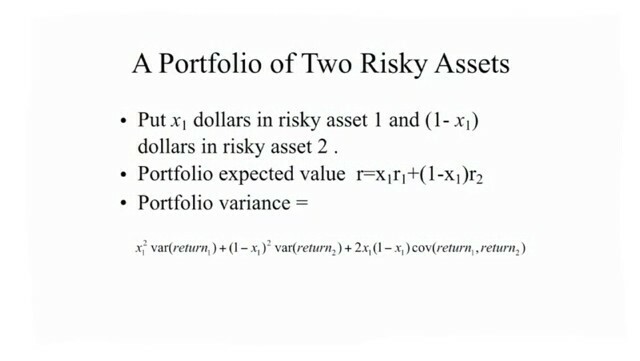 Fourth, there must also be a mathematical model of risk pooling. Fifth, there should be statistical data. In the 1600s mortality tables were calculated for the first time because of an emerging insurance need. Sixth, it must be decided which form the insurance organisation should have. It could be a corporation for the benefit of shareholders or it could be a mutual that is run for the benefit of the policy holders. Seventh, there is need for government regulation otherwise insurance companies may not be trusted. AIG was founded in Shanghai, China in 1919 by an American citizen Cornelius Vander Star. AIG moved its headquarters to the United States just before the communist takeover in 1949. After 49 years, in 1962, he appointed Maurice Hank Greenberg as his successor CEO. Greenberg led AIG until 2005. After Greenberg left, AIG blew up and had to be bailed out. The company failed because of a failure of the independence assumption. It became exposed to real estate risk. The failing assumption was that home prices could sometimes fall in some regions, but never at the same time everywhere. AIG was writing credit default swaps (CDS). They were insuring against default of companies whose business and credit depended on the real estate market. They were also investing directly in mortgage backed securities that depended on the real estate market. All this failed at once. The Federal government decided to bail out AIG and committed $182 billion to this end. The reason for the bail out was fear of systemic risk. If AIG failed then all insurance policies of AIG would be subject to failure. Investment companies and banks could have failed too because they did business with AIG. This created a huge amount of uncertainty. The credit default swap (CDS) was originally invented to insure against the default of a security, for instance a collateralised debt obligation (CDO), which is real estate packaged and sold. Over time this changed, so that the instrument did not have to default, but merely had to lose value. The owner of the instrument often had to put up collateral if the value dropped, even though it did not default. That change was crucial for the failure of AIG. There was a call for billions of dollars of collateral, even though the underlying securities did not default. It was problematic to determine the value of a CDO as there was no price discovery. There was no exchange where CDO's were traded and the government had not regulated credit default swaps. Every broker and dealer had a different price for a CDO. The collateral that was needed depended on the price. Goldman Sachs had the lowest price, and called in more and more collateral. AIG was solvent and policy holders were protected by government regulations. Mr. Greenberg stated that he would not have responded to the call for collateral because there was no real price for the CDO's. After 2005, AIG lost its triple A rating. This also affected the situation, because a triple A rated company did not have to post collateral. AIG ran out of cash because of collateral calls. The government had no plan for a financial crisis and acted ad hoc. Lehman Brothers was allowed to go down. This caused a great upheaval and a loss of confidence. People that had money in investment banks, pulled out. It became impossible to borrow money and the market froze. Goldman Sachs en Morgan Stanley did get a bank holding company licence that gave them access to cheap money from the Fed. Some insurance companies also did get a bank holding licence but AIG was denied one. AIG had to find a solution and borrowed $85 billion at 14.5% interest and the government took over 80% of the shares, and effectively nationalised the company. This money was then used to pay out the owners of the CDS's, for instance Goldman Sachs, 100 cents on the dollar. As there was no price for the underlying CDO's, another price could have been negotiated, for instance 40 cents or 60 cents on the dollar. AIG then lost its credibility and started to lose business. It had to pay back the government. The government sold off AIG assets as fire-sale prices. Currently AIG is a mere shadow of its former self and the government owns 92% of the shares. The government intends to sell the shares, so the stock will remain stuck for the coming years as there are many shares to sell. The Clinton Administration decided that everyone had the right to own a home. It was less important that the owner could afford a home. Historically, mortgages were granted by local banks who knew their borrowers. If a borrower ran into trouble, the bank tried to work it out together with the borrower. The Clinton Administration decided to expand housing. Fanny May and Freddie Mac would buy the mortgages from the local banks. The local banks only serviced the mortgages but they had not any financial involvement once the mortgage was sold. Many people did get mortgages they could not afford. Investment banks in the United States were leveraging their capital. They extended their balance sheets from 5 to 6 times their capital to 30 to 40 times their capital. It was a risk that should not have been taken. The SEC just ignored it. Some investment banks invented new products. They took some existing mortgages of people that could not afford a home. They packaged those mortgages into a CDO. For example, they took mortgages from different regions and called this diversification, so the CDO could be turned into a triple A security. The rating agencies did little research and accommodated this. These CDO's were then sold to clients of the investment banks. In reality those CDO's were not triple A so they were destined to lose value. Because the CDS has changed and also compensated for the loss of value, AIG had to put up billions of dollars of collateral. There was a tendency to apply mark-to-market accounting at the same time, which was the worst possible time as it destroyed balance sheets. It may have been better to keep the securities until maturity. Mathematics is not the only aspect of modern finance. Apart from that there is the contrast between efficient markets view versus behavioural finance. The efficient markets hypothesis of Eugene Fama was introduced in the 1960's. It implies that markets are perfect and efficiently take into account all available information . This view is an extreme and it implies that the best thing to do is gathering as much data as possible and use in the CAPM model to make investment decisions. The only way to beat the market appears to be taking more risk. It turned out that this theory has limitations. Behavioural finance that started in the 1980's and the 1990's highlights a different aspect of markets and makes use of psychology and sociology. Adam Smith already recognised that people do not just want to make money, they want to be praiseworthy. They want to be good people and not just maximise profits. In this way markets become less perfect. The guest spreaker is David Swensen, who managed the financial assets (endowment) of Yale University since the 1980's. His success has influenced many other college and university endowments. Mr. Swensen talks about diversification using CAPM and data about past returns. Data shows that the stock market often outperformed other types of investment, so the portfolio should include a significant amount of stocks. The investment horizon of Yale is long-term. Mr. Swensen achieved such good returns that it cannot be all attributed to gathering data and applying CAPM. The Efficient Markets Hypothesis implies that having information ahead of others can be extremely important. There is a whole industry built around this assumption. Reuters started an financial information service before the invention of the telegraph using carrier pigeons bringing information from London to Paris. People using his service could get information hours or even days ahead of others. Reuters is still in the business of financial information but the business has evolved. Now there are beepers and the internet. If there is financial news, for example, when a pharmaceutical company announces that it has a new drug that is successful in trials, the news goes out via the available channels everywhere. The beepers start beeping and investment analysts start reading the news. A lot of buzz starts as the news has to be evaluated and trading decisions have to be made: "How much will the stock rise? Two dollars? It has already risen one dollar. Ok, buy! Maybe it will only rise $1.50." During the first few minutes after the news the stock price fluctuates, but after some time the stock price settles down at a new level. The next day the news is still evaluated and it may affect the price of the stock. However, people that buy the next day on the news are already late. The efficient market hypothesis implies that you cannot profit from news that is already out. To make a profit you have to receive and process the information faster than others. Harry Robberts first formulated the Efficient Market Hypothesis but is was popularised by Eugene Fama, who referred to it as Harry Robberts' idea . In 1960 the University of Chicago received a grant from the Ford Foundation to assemble all stock price data from back to 1926. It set up the Center of Research of Security Prices (CRSP, often pronounced like crisp) in Chicago. The data had to account for dividends and stock splits. Until then there was no accurate price history of stocks that could be used for scientific analysis for longer periods of time. The data was put on a computer (Univac) tape and sold to researchers that had interest in the data. This so-called Crisp Tape started a revolution in finance based on efficient market thinking. 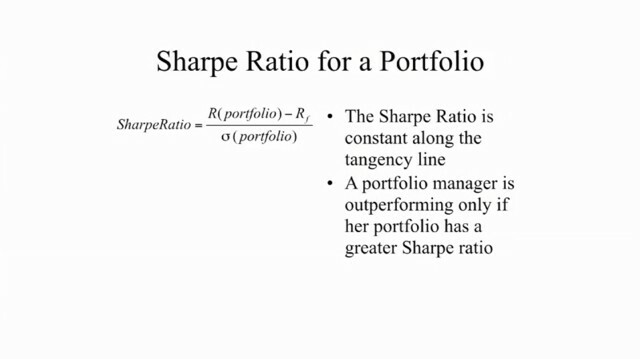 For example, it is not possible to compute Sharpe Ratio's without data. By the end of the decade there were thousands of articles on testing market efficiency. In 1969 Eugene Fama wrote Efficient Capital Markets: A Review of Theory and Empirical Work, in which he reviewed all studies of the Crisp Tape. Fama concluded that despite some negative results, the evidence supported the view that markets are remarkably efficient. This seemed to discredit nearly all investment managers in the country as his conclusion implied that succesful investment managers are just lucky because it is not possible to consistently have above average returns. There has been a change in thinking since then. The change is reflected in the editions of Principles of Corporate Finance written by Richard A. Brealey and Stewart C. Myers. In 1984 the Efficient Market Hypothesis was listed among the seven most important ideas in finance. The 1984 edition still claimed that security prices reflect the true underlying value of assets. In later editions this claim was removed, reflecting the change in thinking about this subject. The 2008 edition states that more research is needed before we have a full understaning of why asset prices sometimes get so out of line with what appears to be their future payoffs. Technical analysis is the analysis of stock prices and other asset prices by looking at charts of those prices. This type of analysis looks for patterns that can be used to predict future price movements. The classical textbook on this subject is Technical Analysis of Stock Trends written by Robert D. Edwards and John Magee. For example, technical analysists suggested in the 1960's, when the Dow first approached the 1,000 mark, that the Dow would have trouble surpassing the 1,000 mark as it could be a psycholical barrier inducing people to sell. It took the Dow more than a year to cross this resistance level. John Magee was a student of psychology. 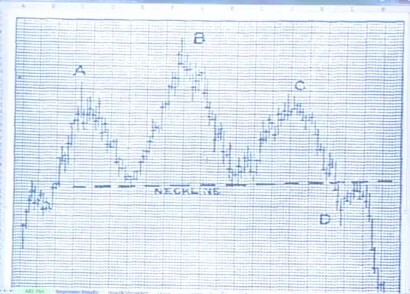 He concluded that some chart patterns really spooked people, for instance the head-and-shoulders pattern. After completing this pattern, a asset price is likely to collapse. The charts below reflects price movement over time and shows the head-and-shoulder pattern. xt = 100 + ρ(xt-1 - 100) + εt, with -1 < ρ < 1. Normally ρ > 0, which means that the stock price reverts to the mean in a slow fashion. 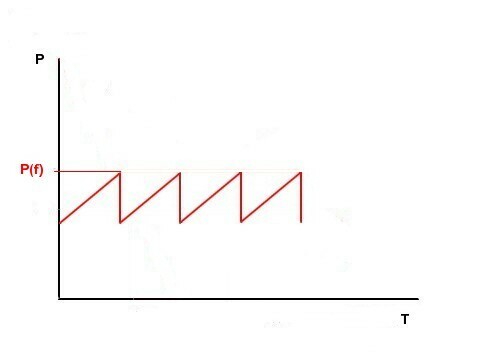 If ρ = 0.5 then, if the stock is above 100, it will be above 100 but half as much the next time, excluding the noise. The stock price tends to go back to the trend. When ρ = 1 this is equal to a random walk. A random walk implies that stock prices are not mean reverting as their direction is completely random. Trends do not exist. This implies that there are no profit opportunities, and buying above the trend line is meaningless. 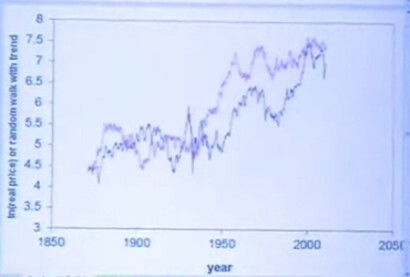 Professor Shiller plotted a randomly generated pattern next to the stock market chart and they look remarkably similar, even though the stock markets seems to have chart patterns. The next graph is an AR-1 with a trend line. There is a profit opportunity by buying below the trend line and selling above the trend line. In reality ρ is close to 1 otherwise there would be too many profit opportunities. In the real world ρ may be 0.99, which does not differ much from a random walk. The random walk part of the efficient market hypothesis did get much attention in the 1970s as people considered this to be exiting new wisdom. In 1973 the book A Random Walk Down Wall Street written by Burton Gordon Malkiel was very popular. Over time it emerged that in the real world the market behaves like an AR-1 with ρ close to 1. There are profit opportunities but they take a long time to come. Behavioural finance and behavioural economics have caused a revolution since 1980. The textbook of this course, Financial Markets and Institutions written by Frank J. Fabozzi and Franco P. Modigliani , does not explain much about the underlying human behaviour. It remains controversial but most people in finance now regard behavioural finance as an important element of finance. Real people are complex, and the functioning of financial institutions depends on the behaviour of real people. At the same time there is a revolution in neuroscience that researches the human brain. Economists have long assumed rationality as a basis for their theories. This has been helpful but it is of limited use as people are often but not always rational. Sometimes people even behave stupidly. Some people take advantage of the stupidity of others. People exploiting other peoples failures has been an important part of history. People are limited and even smart people can make mistakes. Mr. Shiller however believes that the business world in general does not exploit people terribly. Successful businesses in finance and elsewhere consider the long term advantage of having a good reputation, so doing something blatantly exploitive can harm their good reputation. As a consequence, businesses mostly do not exploit human failures, even when they could. Humans have a sense of morality as part of their biological makeup, hence businesses tend to act according certain moral values. Adam Smith was the most important figure in the history of economic thought. In 1759 he wrote his Theory of Moral Sentiments. In 1776 he wrote The Wealth of Nations, which is considered to be the first treatise on economics. Adam Smith wrote that people inherently love the approval of other people, and therefore praise is a fundamental human desire. Normal mature adults develop a desire for praiseworthyness, which means that people want to be good, and not just be praised for something they may not have contributed to. Personality psychology categorises people by their personality. The Diagnostic and Statistical Manual of Mental Disorders (DSM) tries to identify mental illnesses and personality types in a quantifiable and reproducible way so that it is possible to define which people have which personality type or mental illness. As of February 2014, the current version of the DSM is the fifth edition, DSM-5 . DSM has checklists and scores. One specific mental disorder is anti-social personality disorder (APD), also called psychopathy or sociopathy. According to DSM, 3% of the males and 1% of the females has APD. The characteristics of APD mentioned in DSM are: lack of remorse, frequent lying, lack of empathy, superficial charm, shallow emotions, distorted sense of self and a constant search for new sensations. It is a problem for society that some people have a brain structure that is a little different that makes it difficult for them to behave in a good way. One of the most important elements of behavioural finance is the Prospect Theory developed by Daniel Kahneman and Amos Tversky in the late 20th century . It is a theory about how people form decisions about prospects under the condition of uncertainty. The theory states that there is a value function that represents how people value things. There is also a weighting function that represents how people deal with probabilities. The way people value financial gains and losses can be depicted in a graph. Gains and losses are not weighed linearly. For gains, the effect of diminishing marginal utility applies. Losses weigh more heavy than gains, so there is kink at the origin of the graph. 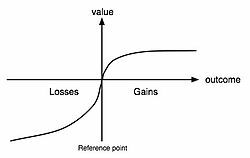 Gains and losses are estimated from a reference point, which is psychological and subject to manipulation. The reference point can be today's wealth, but it can be something else if people are manipulated by the way something is presented to them. Framing is presentation that can change people's behaviour. It is possible to manipulate people by describing something in different terms and suggesting a different reference point. The kink in the origin implies that people are very sensitive to little changes in their wealth and that they can be spooked by them. The value of the outcome can decline rapidly, even for a small loss. For example, if someone lost a wallet with 20 euros, he or she would feel extremely bad about it, even though 20 euros is a small sum of money. Small gains do not have a similar positive effect. Business people can exploit this behaviour if they want to, for example by selling insurance on those small events, for example funeral insurance. Insurance should be about big events that people cannot afford to pay for, such as a life insurance of a breadwinner. For example, the probability of an airplane crash may be 1 in 10 million so most people assume it is zero. In this way there is no need to worry about it. Some people do not round it to zero and blow it out of proportion so they start to worry a lot. If the probability is very high, then people also do not want to think about it and assume that it is one. The regret theory states that people fear the pain of regret. This is represented somewhat in the kink in the value function of the Prospect Theory. The expectation of regret can become a painful emotion so people may start to avoid doing things they may regret later. This can create problems as it can cause bad decisions when people are overly worried. Gambling occurs in every human society. In 1974 it was reported that 61% of the adults gambled for money at least once in the last year. 1.1% of men and 0.5% of women are considered to be compulsive gamblers. Gambling can be like a drug addiction and people that are depressed can go to a casino to get out of the depression. Gambling can make people feel invigorated. In 1811 the New York State passed a corporate law that produced a lot of questionable companies. People then said that this was bad because it is just gambling. On the other hand, gambling behaviour is normal. It is an aspect of human psychology and related to sensation seeking. Most people have this kind of behaviour to various extents. The stock market can channel gambling behaviour into something productive, and stock markets therefore often stress that they are a serious kind of business. Psychologists have discovered in experiments that humans tend to over estimate their own abilities. This is called overconfidence. Most people think that they are above average. Some even think that they far better than the average. Psychologists have researched the thought patterns coinciding with overconfidence. People tend to think that they understand the world better than they really do. This is an illusion as the world is infinitely complicated and there are many surprises. It is impossible to see all possible perspective at the same time. Rakesh Khurana wrote a book named Searching for a Corporate Savior: The Irrational Quest for Charismatic CEOs. He claims that there is a tendency to think that CEOs are geniuses. Companies try to find a genius CEO as a kind of manipulation of the stock market. A CEO that successfully ran other companies in the past can make the stock price go up. The people hiring the fake genius can then cash in their stock options. Khurana claims that some CEOs are geniuses but most of them were just lucky and developed overconfidence. The new CEO, who may know little of the new company, then just starts reorganising and laying off people, and ruins things. Cognitive dissonance is the excessive mental stress and discomfort experienced by an individual who holds two or more contradictory beliefs, ideas, or values at the same time . Professor Shiller narrows it down to a judgemental bias that people tend to make because they do not want to admit that they are wrong. It is painful to think to have believed in something that turned out to be wrong as their ego is involved with their beliefs. They cling to old beliefs and look for evidence that supports those beliefs. Cognitive dissonance was first researched by the social psychologist Leon Festinger in the 1950s. There are examples of the effects of cognitive dissonance on finance. Professor Goetzmann of Yale found that when a mutual fund has a bad investment perfomance, many investors sell the stock and go out of it. But some of them hang on, possibly because of the effect of cognitive dissonance. Those often did not even know how bad the fund had performed as they had blocked the information out. They may think that they have made the right investment decision and just ignore the evidence that they made a wrong choice. Social psychology reflects on the fact that people are interdependent. What people think is affected by what others think. A popular term is herd behaviour that refers to the tendency of people to move with the group. They do not do this consciously, as they do not think that they move with the herd. The sociologist Emile Durkheim discovered in the early 20th century the existence of a collective consciousness, which means that our opinions about what is happening are formed by a collective understanding of what is going on. People tend to think of themselves as being rational. People have a sense of what is going on in the world. However, they tend to underestimate the arbitrariness of their views and the fact that their views are shared by millions of other people. Everyone lives in a certain point in history where certain ideas and concepts are circulating, which can be called the zeitgeist, which means spirit of the time. The zeitgeist is determined by a collective memory or collective set of facts that is used in thought processes. Herd behaviour caused by the zeitgeist can cause big swings in markets. According to Professor Shiller there is a development towards better financial institutions. There is a lot of manipulation and exploitation but society has outlawed many of those practices. When David Swensen started at his job for Yale, he thought that the existing portfolio failed the basic common sense concepts of diversification and equity orientation, which prompted him and his colleagues to go a different path and to create a portfolio with more exposure to equities and more diversification. He discusses the developments during his tenure that started in the middle of the 1980s. There are three things that affect the returns. First, there is asset allocation, which is the decision about what assets classes must be in the portfolio, for example foreign stocks, real estate, bonds, venture capital and resources. Also the allocation is terms of percentages is important. Second, is making market timing decisions and establishing targets for the portfolio regarding the asset allocation. When domestic stocks are deemed expensive and foreign stocks are deemed cheap, it is possible to reduce exposure to domestic stocks and increase exposure to foreign stocks. The returns can be attributed to deviation from the long term targets can be attributed to market timing. Third, there is securities selection. 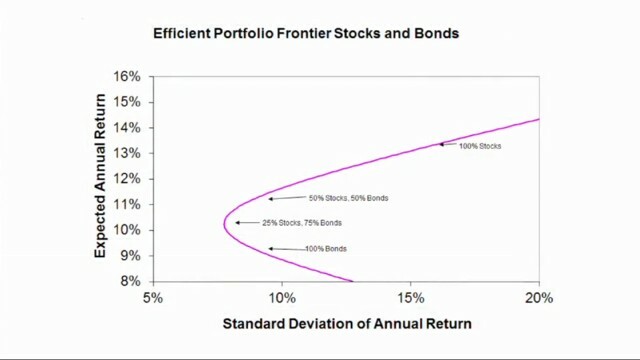 If the allocation is domestic equities, and the selection is equal to the market, for example an index fund that holds all securities in the market in the proportion that they exist in the market, then the returns due to security selection are zero as the portfolio performs in line with the market. If the security selection deviates from the market, then the difference with the market return can be attributed to security selection. For example, if a market participant expects that Ford will do better than GM, then he or she can go overweight Ford and underweight GM. This is a zero sum game as other market participants must be underweight Ford and overweight GM. The amount the winner wins in relative performance, is the same amount someone else loses in relative performance. The expected return of making active investment decisions like security selection is negative, and the difference is syphoned off by Wall Street in the form of fees and commissions that are charged to manage the portfolio. An article in Barron's expressed criticism on the Yale model and the Swensen approach. First is argued that diversification is failing. In a panic only two things matter: risk and safety. This was true in 1987, 1998 and again in 2008 in a way that was even more profound than in 1987 and 1998. Investors sold everything with risk associated to it to buy US Treasuries as safety was all that mattered. In that narrow window of time diversification does fail. Under normal circumstances there are significant opportunity costs associated with being in safe assets like US Treasuries. Safe assets are only attractive for specific short timeframes. If there is a longer term investment horizon then it is better to have a relatively small amount of safe assets like US Treasuries. Diversification is important. For example, for a Japanese investor diversification out of Japan would have produced far better returns after the Nikkei hit 38,000 in 1989. Twenty years later in 2009, the Nikkei closed at 10,500. With a long time horizon and being in equities, a Nikkei investor would have lost 73% (excluding dividends, not mentioned by Mr. Swensen). Diversification therefore makes sense, also in the long run, even if there are occasional panics. The second criticism on the Yale model and the Swensen approach is that it places too emphasis on alternatives. In the decade of 2000-2010, domestic equities provided a negative return of 0.7% per year while bonds had a positive return of 5.9% per year. Some alternative provided better returns: private equity 6.2%, real estate 6.9%, timber 12.1% and oil and gas 24.7% per year. The numbers speak for themselves. Over the long run diversification and equity orientation pay out. The performance is also impressive. In 1985 the Yale endowment was $ 1 billion and the amount redistributed to Yale's operations was $ 45 million. In 2010, the Yale endowment amounted to $ 16 billion and the amount redistributed to Yale's operations was $ 1.1 billion. Stocks and bonds are traditionally the main categories of financial investments. For bonds the return is the coupon or interest and for stocks the return consists of dividends. The difference is not as clear as most people think. Stocks are not all the same. For example, if a company issues more shares, this is called dilution. Dilution makes the shares less leveraged and less risky. If the company uses the proceeds to buy bonds, then the stock represents the bonds the company owns. If the company decides to borrow money and buy back shares, which is the opposite of dilution, then the company becomes more leveraged and riskier. Stocks are an essential element of the modern capitalist economy because of the functions they fulfil. Also the effects of interest and compound interest are of importance. The difference between an average yield of 5% and 7% per annum is benign in the short run. However if one invests for a longer time horizon, the difference becomes more significant. For example, if one invests $10,000 for forty years with quarterly compounding, 5% compounds to approximately $73,000 and 7% compounds to approximately $160,000, a difference of approximately $87,000. It is important to appreciate the power of compound interest. The guest speaker is Laura Cha from Hong Kong, who is on the board of directors of HSBC. She was also the on Executive Council of Hong Kong and worked for the China Securities Regulatory Commission in mainland China. She has an interesting story to tell about the development of Hong Kong as a financial centre. When she started on her job as a regulator in Hong Kong, Hong Kong was an insignificant local stock market. With the help of good regulation it won the trust of the entire world and became a major international financial centre and a major centre for the trading of shares from mainland China. Stocks and stock exchanges are not just certificates and institutions. Stock are claims of ownership of organisations that consist of people. Those people matter as they affect the risks and returns of the financial instruments. Regulation is important. Regulators set the rules of the game and they need to be public spirited. Regulators can make changes that matter. Business people are to some extent also self regulators because of the personal integrity that they feel and because of their concern for the long run health of their business. This is not always true. For example, the Buttonwood Agreement that created the New York Stock Exchange was a mere price fixing agreement. Over the years the New York Stock Exchanges has adopted a stronger sense of public trust. In 2011 the New York Stock Exchange was about to be taken over by the German stock exchange Deutsche Börse after it had merged with the Dutch stock exchange Euronext. This deal was blocked by the European Union and the New York Stock Exchange was subsequently taken over by the US company ICE (Intercontinental Exchange) in 2013. These deals demonstrate the importance of the interlinkages in the ownership of ownership of stock markets. The stock markets have now so many interlinkages that they have become an international market. This is important for the understanding of how the world is evolving in the 21st century. Many people think that their identity is determined by the country they live in. This is still true to some extent, but their identity is also defined by the company they work for. Increasingly companies are owned by people living all over the world. We are living in a period of financial capitalism and this affects the lives of everyone. It involves governments but also people. The development of financial capitalism itself is not a moral issue. Professor Shiller mentions that morality is driven by people, their culture and their principles, which becomes increasingly the basis of the society we live in today. 3. the interest rate could reflect time preference. People prefer to have a good or service the present over the future. If the rate of interest is 5% this may imply that people are 5% happier to have something now compared to the future. Irving Fisher wrote in his 1930 book named The Theory of Interest that the interest rate is the intersection of a supply and demand for savings. According to the theory, there is more supply of savings S if interest rates are higher. On the other hand there is demand for investment capital D. The lower the interest rate, the more demand for investment capital there will be. This can be plotted in a graph. The equilibrium interest rate r' as well as the equilibrium of savings and investments S' is at the intersection of those lines. There is also a two period diagram in Irving Fisher's book The Theory of Interest that reflects the Eugen von Böhm-Bawerk causes of interest. Assume a Robinson Crusoe economy with only one person so there is no trade. There is still interest in this economy. Assume that Robinson Crusoe has grain. He has to decide how much he will eat this year and how much he will plant so he will have grain the next year. He could eat all the available grain, but then he will have nothing to eat next year. For every bushel of grain he sows, he may have two bushels of grain the next year. This can be represented in a production possibilities frontier (PPF). The intersection of the PPF and the X-axis represents the amount of grain Robinson could eat this year when he does not leave any grain to sow next year. The intersection of the PPF and the Y-axis represents the amount of grain Robinson could eat next year when he uses all his grain to sow next year. According to micro economic theory, Robinson Crusoe has indifference curves that represent equal utility. 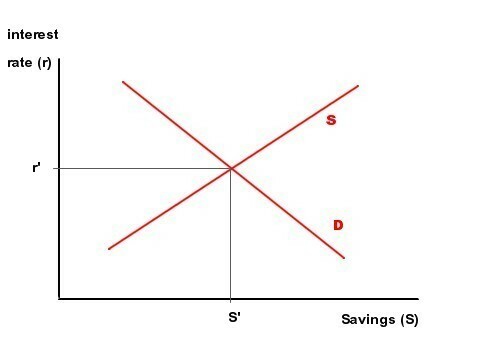 The more the indifference curve is shifted to the right, the higher the utility is. Based on his highest indifference curve, he might settle for an amount of T' grain this year and N' grain next year. The red line S represents his savings. The slope of the productions possibilities frontier (PPF) reflects the interest rate, and slope = -(1 + r) where r is the interest rate. 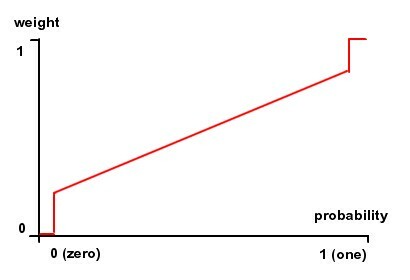 In this case slope = - 2 so r = 1, which implies an interest rate of 100%. This reflects the assumption that for every bushel of grain he sows, he may have two bushels of grain the next year. The underlying Böhm-Bawerk causes for the interest to exist in this case, are technical progress or roundaboutness of production. 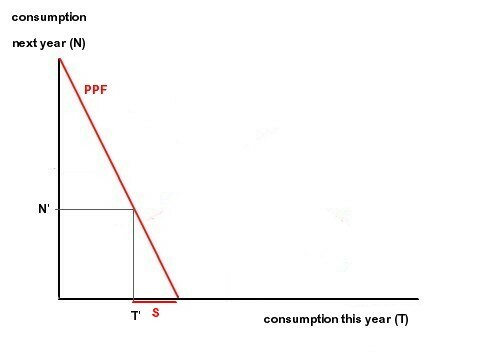 In this case the time preference does not matter as the interest rate is determined by the slope of the production possibilities frontier and not by the indifference curves. The next step is to assume that there are diminishing returns for growing more grain. For example, there may be a limited amount of good land or they may be too many weeds to farm a large area effectively. This affects the productions possibilities frontier and it now curbes downwards. Robinson Crusoe will still choose the highest indifference curve that touches the productions possibilities frontier. The interest rate is now the slope of the tangency between the indifference curve and the production possibilities frontier. Now time preference affects the interest rate. 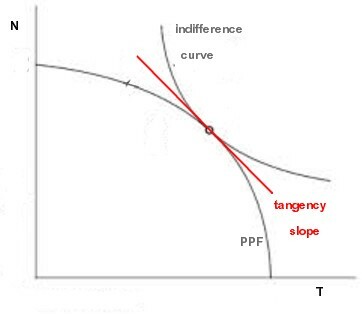 The tangency slope equals the slope of the indifference curve as well as the PPF at the tangency point. Assume now that there are two persons on an island. Assume that they both have the same technology, and therefore have the same productions possibilities frontier, but they live on opposite sides of the island and do not trade with each other. Assume now that person A is rather patient while person B is rather impatient. Suddenly they find each other. What should they do? It seems that Person A may be better of by producing less as his extra investments do not generate good returns. Person B could produce far more with the same investment. Person A may then propose to Person B to plant some of his grain for him because Person B is more productive. Person A will lend grain to Person B and expect more in return. The agreed interest rate may be represented by the red line. Both can be better off, and achieve higher utility, as their tangent indifferent curves can move to the right. 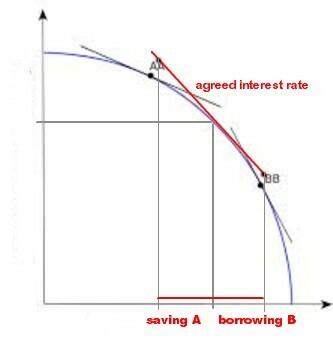 Saving and borrowing must be in equilibrium, meaning what Person A saves must be borrowed by Person B. The interest rate can be determined by the slope of the line and slope = -(1 + r) where r is the interest rate. p = $100 / (1+r)T.
(1+r)T = 100 / p.
Annual compounding means that you do not earn interest on interest until after one year. Assume that you put $100 in the bank. If the interest rate is r, then after six months you have: $100 (1 + ½r). After a year you have: $100 (1 + r). After one and a half year you have: $100 (1 + r) (1 + ½r). After two years you have: $100 (1 + r)². If there is compounding every six months, then you have after six months: $100 (1 + ½r). After a year you have: $100 (1 + ½r)².
p = $100 / (1+Z)t where t = 2T. PDV = x / (1+Z)t.
PDV = x e-rT, where e ≈ 2.718, which is the mathematical constant that is the base of the natural logarithm and r is the interest rate for continuous compounding. PDV = t=1Σ∞ ( xt/(1+r/2)t ). PDV = 0∫∞ ( xte-rt) dt. It is important to recognise that payments in the future are worth less than payments today so present discounted value (PDV) is one of the fundamental concepts in finance. Whenever there is a stream of payments in the future, they must be discounted using the appropriate PDF-formula. A conventional bond, which can be a corporate bond or a government bond, is a combination of an annuity and a discount bond. It often pays a coupon C every six months until maturity, and a principal plus a coupon at maturity. This is an annuity and a discount bond taken together, so the present discounted value of this bond is the sum of the annuity based on the coupon plus the present discounted value of the principal. At every point in time there are interest rates quoted for various maturities. This is the term structure of interest rates. Currently, one year interest rates are around 1% if you have excellent credit, but for ten years it may be 3.5%. The longer the maturity, the higher the interest rate becomes, at least on most occasions. There are implicit forward rates in those interest rates and maturities. The concept of forward rates is first described by Sir John Hicks in his 1939 book Value and Capital, and it is the implied interest rate between two future dates. Assume annual compounding, and assume it is 1925 and that an investor expects to have ₤100 to invest in 1926 for one year, and he wants to lock in the interest rate in 1925. If there are bonds that match the required maturities, and it is possible to go long and short those bonds, then it is possible to lock in the one year interest rate for the next year. For example, it is possible to buy a two year discount bond and sell a one year discount bond in 1925 and lock in a one year interest rate for 1926. The amount of two year discount bonds to buy is: ₤100 (1 + r2)² / (1 + r1), with r1 being the one year interest rate and r2 being the two year interest rate. The amount of one year discount bonds to short is: ₤100, or a present discounted value of ₤100 / (1 + r1), with r1 being the one year interest rate. After one year, the investor has to pay ₤100 for the shorted bond at maturity, which is the amount he intended to invest. At the end of the two year period, he receives ₤100 (1 + r2)² / (1 + r1). The return on this investment is the forward rate. The forward rate f for this investment can be calculated as follows: 1 + f = (1 + r2)² / (1 + r1). 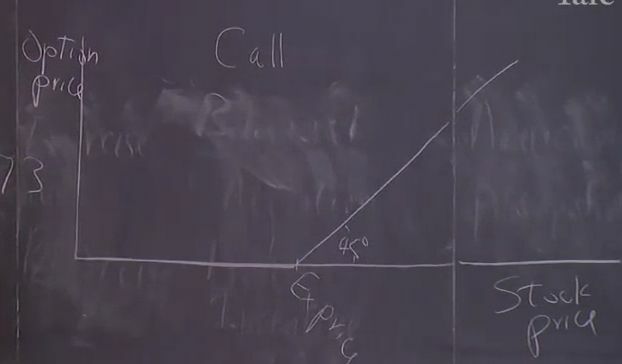 The expectations theory of the term structure states that the forward rate is the expected spot rate. Using existing data on interest rates, it is possible to calculate the implied interest rates for every year in the future. In theory if would have been possible to calculate the implied rate for 2011 in 1925 if there was an appropriate set of bonds to do the calculation. The simplest theory is that forward rates are just predictions of future interest rates. It is possible to test the expectations theory of the term structure by looking at forward rates in the past and the real rates for the years they allegedly predicted. It may now seem that the whole future is planned in those markets. To some extent this is right, but it does not account for human behaviour. This is the field of Behavioural Economics. Professor Shiller does not mention this, but the expectations theory of the term structure is failing. One explanation is uncertainty about future interest rates making people willing to pay more for longer term rates. Professor Mehrling thinks that the difference between the current forward rate and the current expectation of the future spot rate is just the expected profit from an unhedged forward exposure . The modern theories of Eugen von Böhm-Bawerk, Irving Fisher and Sir John Hicks have replaced ancient thinking. The Bible and also the Quran condemn charging interest . The Latin word usura means use but it also means interest. By lending out money, the lender gives the borrower the use of the money. This ancient word had a negative connotation and charging interest was considered to be immoral. This gave rise to the word usury. Usury means both interest and excessive interest. Christian scholars in the Middle Ages considered all interest as immoral and Islamic scholars still do. The only people that were allowed to charge interest were the Jews, even though they were forbidden to charge interest to each other. So why was it considered to be immoral when the economic logic speaks for itself? In the example of the two people on the island, where one is borrowing and the other is lending, both could be acting against their own interest. Maybe it is better for the borrower to eat less and sow more, while it maybe better for the other to eat more. This boils down to the question of what people are doing with their loans. Does the financial world give people good advice or is there a tendency to be usurious? Is the financial world victimising people by lending them money? There is a problem and there is thousands of years of history on it. The concern about usury comes from real problems. For example, there are 1.6 million websites encouraging people to take out a loan for a vacation. Franco Modgigliani mentioned that one of the best investments you can ever make is a honeymoon. Honeymoons create a bond and memories. There are many lenders willing to lend money for a honeymoon and Professor Shiller thinks that you should borrow money for it if you do not have it. Professor Shiller is not sure whether or not usury is bad. Elisabeth Warren has written a book called The Fragile Middle Class that is about people going bankrupt. Even when the economy did well, there were a million personal bankruptcies per year. This is because of borrowing. Most people that have gone bankrupt are ashamed of it and cover it up. Elisabeth Warren thinks that the lending industry is victimising people. The aggressively advertise loans but do not tell people about the bad things that may come from too many loans. In 2008 she wrote in Harvard Magazine describing all the abuses happening in lending in the United States. This was a great success and as a consequence there was a Consumer Financial Protection Bureau inserted in the Dodd-Frank bill. There is now a new regulator to stop usurious practises in lending. But she may have been too harsh in criticising the lending industry, so President Obama could not appoint her to be the head of the Consumer Financial Protection Bureau. Similar steps are taken in Europe as the financial crisis revealed bad lending practises. Professor Shiller thinks that government regulation is needed to curb abusive lending. The word corporation comes from the Latin word corpus, which means body. A corporation is a legal person or an artificial person. The idea of a corporation goes back to ancient Rome where they were called publicani. There were only a few of them and there was no stock market. It was not until the 19th century that corporations became important. A corporation is owned by shareholders. In most corporations, all shareholders are equal. This is the reason why their contribution to the corporation is called equity. Normally, every share has one vote. There are exceptions, such as non-voting shares. Shareholder democracy implies that the shareholders can appoint the Board of Directors and it is inspired by political democracy. In the United States, a corporation must be located in a state. Each state has its own corporate laws. Many corporation therefore prefer to be located in Delaware because of the laws and taxes of this state. The state dictates some basic rules, for instance that there must be an annual meeting of shareholders. The Board of Directors appoints a Chief Executive Officer (CEO). The CEO reports to the Board of Directors. In the US the CEO is often also the Chairman of the Board, but in Europe this is less likely. The value of a share in the company is equal to the total value of the company divided by the number of shares. The market capitalisation (or market cap) is the value of a share multiplied by the number of shares outstanding, which is also the value of the company. Every share is treated equally, for example they all have the same dividend payments. The Board of Directors decides about the dividend payments. Dividends are the distribution of profits. Ultimately, people own shares to receive dividends. Typically, young companies do not pay dividends, possibly because they do not have much profit or because they must invest heavily to have more profit in the future. For example, Microsoft did not pay a dividend for decades. All profits were invested in the company. If it was known that Microsoft would never pay a dividend, the nobody would want to own the shares of Microsoft. It is a common misunderstanding that stocks are bought because the price goes up. At least in theory, the price of a stock will go up only if people expect that there will be more dividends coming in the future. The price of a share ought to be the expected present value of all future dividends. The true value of a stock in the future dividends. If the Board of Directors does not pay a dividend, shareholders may vote for another Board of Directors. When a dividend is paid, the price of the share falls. This is because the company is worth less after paying a dividend. The new price is called the ex-dividend price. Often there is an x after the stock price quote after the dividend is paid. Dilution refers to an expansion of the number of shares. Extra shares may be issued for new investments or to cover large losses. Existing shareholders have to carefully consider dilution and whether or not it is beneficiary to them. Dilution decreases their share in the company, but if it improves the prospects of the company, shareholders may be better of with dilution. The opposite of dilution is when a company decides to repurchase shares. Repurchasing shares as well as dividends are ways to return money to shareholders. A reason to repurchase shares in the past was that dividends used to be taxed at a higher rate than capital gains. Now those tax levels are the same, but still complications around taxes may be a motivation to repurchase shares. Common stock is the real ownership in the company and it is the highest in the hierarchy. Preferred stock pays a fixed dividend but the Board of Directors may cancel this dividends. However, no dividend can be paid to the owners of common stock, unless all dividends to the owners of the preferred stock are paid. Preferred shareholders typically do not have a vote. Preferred stock is similar to a bond. Preferred shares are safer than common shares but they do not have the same upside potential. Laura Cha started as a lawyer and she did this work for seven years. Her field was foreign investment into China during the 1980's. In this capacity she dealt with a number of multinationals on the corporate side as well as the finance side. However, most of her career she worked as a regulator. She was headhunted to join the newly founded Securities and Futures Commission in Hong Kong in 1990. She did this work for 10 years and then was offered a job at the Chinese regulator. This job she did for 4 years. She became the first person from outside Mainland China to join the Chinese government. She was pleased with her job, because as a regulator she facilitated the development of the Hong Kong market. In the 1970's and the 1980's Hong Kong was largely a local market and international players considered this market as too small for them. This changed in 1992 when the Chinese government decided that they wanted to use the Hong Kong market to help to transform the state owned enterprises. Because Laura Cha had experience with the Chinese market in the 1980's, she became the person that had to design a structure for state owned enterprises in Mainland China to become listed as publicly traded companies in Hong Kong. Her job was laying a foundation and a design. She was aware of how important this work would be for the future. Twenty years later Hong Kong has become a large international market. All the big players are there. More than half of the market capitalisation and turnover on the stock market comes from Chinese companies. The coming of the Chines companies to the Hong Kong market transformed those companies as well as the Hong Kong market. Without the Chinese enterprises, Hong Kong probably would have remained a local market. Another job she performed was to demutualise the Hong Kong stock and futures exchange and to merge them together with a clearinghouse. The Hong Kong stock exchange became a listed company. Today the Hong Kong stock market has the largest market capitalisation in the world, more than the New York Stock Exchange or the London Stock Exchange. When she came to China, the market was not yet developed as China was a socialist country. There was little knowledge of Capitalism and stock markets. During her tenure at the Chinese regulator she promoted corporate governance. She introduced quarterly reporting and the requirement of independent non-executive directors. It was an exiting time. She felt that her work in the public sector was making a difference. She was able to help the market change and to make things right if something went wrong. Work in the private financial sector may be financial rewarding, but in the public sector the reward comes from contributing to the social good. She considers it to be a good thing in the Unites States that there is a lot of interchange between the public and private sector. She thinks that this helps to make the US markets vibrant. The public sector needs people from the private sector with market experience. Regulators should have knowledge of how the market works. It is also be healthy for the market that people with a public mindset work in the private sector. In the past the US has been the main centre of the financial services, and to some extent it still is, but the world outside the US has undergone a lot of changes. In the globalised market of today, people can find equally exiting jobs outside the United States. In the 1980's the only alternatives were in the mature market of Europe and the UK. But in the last decades opportunities in Asia and Latin America arose. If you intend to have a career in financial services, you should not rule out working in a foreign country. Emerging markets may have the best opportunities and you may have more responsibilities at an earlier age. Working in a developing market is interesting as well as frustrating. The rules are not so clear and the people are not as sophisticated and educated as people in mature markets. According to Laura Cha, China does not have a lack of regulation, but better application and enforcement of regulations is needed. It is important that regulation is clear, consistently applied and fair. As in many emerging markets, enforcement has to improve in China. China is developing fast, and the market developed faster than the government and the regulators anticipated. The US markets are a lot more developed, but China is catching up. China has not the luxury to wait with enforcement. Whether or not the lack of regulation is an impediment to foreign investment, remains to be seen. China is the largest recipient of foreign investment, so the conditions in China are not that bad. There probably are enough opportunities, despite the fact that markets in China are not as developed as in the West. Enforcement costs resources, and the regulators in China, like most regulators, can use more, most notably people. Property, which includes real estate and land, may be the most important asset class in the world. In general it is privately held, even though in China the government technically owns the land. Private ownership gives an incentive to maintain the property. Rental properties are also mostly privately held and the owner often develops a relationship of trust with the tenants. Property is also a political aspect of finance because home owners vote, hence politicians tend to support causes related to real estate. There is much interaction between politics and real estate. In 1938 the Federal National Mortgage Association (Fannie Mae) was established to provide local banks with federal money to increase home ownership and the affordability of housing. In 1934 the Federal Housing Administration (FHA) was introduced that insures mortgages against default. These programmes to subsidise the housing market were introduced during the Great Depression and they were never discontinued. In 2011 Fannie Mae and Freddie Mac went bankrupt. In 2013 the FHA went bankrupt too. They were bailed out by the government. This does not mean that those institutions have failed as they had a role in managing risk. Mortgage institutions and financial institutions manage risk. Some of those risks cause major crisis, such as the financial crisis of 2008. Regulation and institutions that regulate business activities can come from the government as well as from outside the government. The Financial Accounting Standards Board (FASB) is a private, not-for-profit organisation whose primary purpose is to develop generally accepted accounting principles (GAAP) within the United States in the public's interest. There are a lot of different forces that help to regulate the business sector, mostly because of financial interests. Carl Icahn can be seen as a self-appointed regulator. He buys an interest in companies he thinks are not managed well. Management can get complacent and not willing to make hard decisions. He then goes in and makes the hard decisions. He appears to be a realist and like to tell things as they are. Even though he is not always right, he has been successful. According to Professor Shiller, finance is not eveil and many people that make a lot of money end up giving it away, or at least they should give it away. Carl Icahn is an important philanthropist and gives money to health care and community spirit causes. Edward P. Evans, a former CEO of the Macmillan publishing company, donated $ 15 million to Yale to build a new management school. Also a former Chinese student of Yale donated $ 8 million to Yale. Yale University was created from a gift from Elihu Yale, a governor of the British East India Company in Madras. Using financial levers, those people contributed to good purposes. The Peruvian economist Hernando De Soto, wrote a book called The Mystery of Capital, explains that many developing nations lack formal property rights, which is important for Capitalism to succeed. In many developing nations mortgages are not available because ownership cannot be established from formal documents or the laws surrounding mortgages may not be well developed, for example it may be difficult to foreclose if the borrower does not pay. Many developing countries have left leaning governments that may support borrowers that do not pay. Many large buildings in the United States are owned as partnerships or Direct Participation Programmes (DPP) rather than corporations. Partners are not shareholders but participate directly. The reason is that corporations have to pay a tax on their income while the owners have to pay a tax on their income too. In a partnership this double taxing can be avoided as the income from a partnership is seen as personal income. Partnerships are only open to accredited investors that, that according to the Securities and Exchange Commission (SEC), do not need the protection of the SEC. Mostly those are wealthy people. Government regulations block the use of partnerships in other areas. For example, partnerships must have a limited life, while a corporation can continue to exist indefinitely. The indefinite lifetime of a corporation determines its value as there may be future growth. For buildings, a partnership is suitable, as the building it bought, depreciated and sold at the end of its economic lifetime. DPP's typically are small and often include just one building and they may last 10 to 20 years. General partners run the partnership and do not have limited liability. Limited partners are passive investors and they have limited liability. The DPP can mortgage the building. DPP's became criticised because they were not open to small investors. Small investors were taxed twice and they could not diversify into property. In 1960 Congress created Real Estate Investment Trusts (REIT). This started in the United States. Now they are copied all over the world. REITs were intended for small investors and they were not double taxed either. They are limited to real estate and 75% of the assets must be in real estate or cash, 75% of the income must be from real estate, 90% of the income must come from real estate dividend and capital gains, 95% of the income has to be paid out, and less than 30% of income should come from the sale of property held less than four years. The REITs had a slow start, but began to spread during a number of booms. The first boom was in the 1960s, when interest rates rose above deposit ceilings, and REITs offered better rates. There was a second boom after the tax reform of 1986, when some tax advantages of DPP's were eliminated. The generous depreciation allowances for partnerships had been used to make profits disappear, and this made people invest in buildings too much, creating a distortion of the market. During the real estate boom of the 1990's more REITs appeared. Now REITs are big and important, but it took 50 years to get to this point. There have been two issues behind this process. First, the finance industry found it difficult to innovate, and innovations take many years to happen. Second, there is a trend towards democratisation of finance. Residential real estate is bigger in numbers as well as value than commercial real estate. In the US, and a large number of other countries, about 2/3 of the households own their home. This high level of home ownership is a product of government policies that encourage mortgage lending. In the US these policies have a historical background. During the Great Depression there was a severe housing crisis in the United States. Home prices were falling and many people were defaulting on their mortgages. The government created the Home Owners' Loan Corporation to bail out 20% of the home owners. Before the Great Depression, mortgages were growing but they tended to be 2 to 5 years and balloon payment. For example, if you bought a house in 1920 for $ 10,000, you could borrow $ 5,000 and pay interest every month and after two years you had to repay the $ 5,000, which is the balloon payment or a very big payment. Then you could try to get another mortgage. Despite that, mortgages became increasingly common as people expected that they could borrow again after the term of the mortgage ended. During the Great Depression, unemployment went up to 25%, home prices fell often by more than half, and mortgages were often not renewed. Many people were forced to dump their house on the market and declare bankruptcy. The Roosevelt Administration decided that this type of mortgage was problematic and set up the Federal Housing Administration (FHA). The FHA was provided mortgage insurance in a bid to get lenders provide mortgages again. If a house was foreclosed, but not worth less than the mortgage, the government made up the difference. Those mortgages had to last 15 years or longer, and they had to be amortising mortgages with a series of instalment payments instead of a balloon payment at the end, in order to be eligible for insurance. The US government imposed those terms on the mortgage industry as it claimed that the old terms imposed too much of a burden on ordinary people. Some banks offered this type of mortgages in the 1920s but it was innovative finance and too complicated for most people so it never caught on. At first 15 year mortgages were the standard, but in the early 1950s 30 year mortgages became the norm. During the lifetime of the mortgage the monthly payment is fixed. Interest payments go down as the remaining balance reduces so instalment payments go up. As the calculation was cumbersome in a time without computers, tables were made per mortgage lifetime and interest rate, showing the monthly interest payments, the monthly down payments on the principal, and the monthly remaining balance for a $ 1,000 mortgage. Those tables are important because people may move and sell the house before the mortgage is paid off, so the bank has to know what the remaining balance is. In 1934 this was an innovation but now this is a conventional fixed rate mortgage offered all over the world, but only in the US and Denmark this has become the most important type of mortgage. In 1938 the Federal National Mortgage Association (Fannie Mae) was established as a federal agency that bought mortgages from banks to support the mortgage market so banks had more free reserves to make new mortgages. In 1938 this made sense because the housing market was depressed and there were many unemployed construction workers. In 1968 the US government privatised Fannie Mae. In 1970 a similar institution, the Federal Home Loan Mortgage Corporation (Freddie Mac) was created. Also Freddie Mac became a private corporation. Initially, Freddie Mac was intended to buy mortgages, repackage them as mortgage securities and sell them off to the public with a Freddie Mac guarantee against default. Soon Fannie Mae also entered the mortgage repackaging business. Now those institutions guarantee trillions of dollars of mortgages. The government had stated that those institutions were not backed by the federal government. In 2008 a housing crisis started similar to the one of the Great Depression and both Fannie Mae and Freddie Mac went bankrupt. The Republican Bush administration did not like bail outs, but people all over the world assumed that Fannie Mae and Freddie Mac were federal institutions that had government backing. The Chinese had put billions of dollars in Fannie Mae. The Wall Street Journal used to list their bonds as government securities. The US wanted to keep its reputation as a safe haven, so Fannie Mae and Freddie Mac were put under federal conservatorship..
Mortgage backed securities like the Collateralised Mortgage Obligation (CMO) have been divided into tranches based on prepaiment risk. There is a risk that the mortgages will be paid off early in times when it is against the interest of the investors. Some were rated triple A and sold to investors all over the world. A collateralised debt obligation (CDO) hold mortgage securities as their assets, and many held sub-prime mortgages. Even though they were rated triple A, many defaulted. They also had been sold all over the world as the United States is a leader in mortgage finance and many institutions sold those securities. Many institutions in Europe and Asia invested in those securities as they were rated triple A and considered to be safe. Some issuing institutions had doubts about the safety of those mortgage securities, but they did not care as they could make money from them. Mortgages became complicated. The house owner only had contact with the mortgage service company, but there were also organisations issuing CMOs and CDOs that included the mortgage. During the financial crisis of 2008 the scheme collapsed. Steps have been taken to stop this from happening again. The most important change that has been made in both Europe and the United States is the requirement that mortgage originators keep a 5% of the mortgages in their own portfolio. This is supposed to reduce the moral hazard problem that caused the crisis while retaining the securitisation of mortgages. - international regulations set by international organisations. A modern corporation has a Board of Directors. Their work looks a lot like the work of regulators. Most companies have inside directors who work for the firm and outside directors who have nothing to do with the firm. Most notably, the outside directors make the board into some kind of regulator. People are different and some people show more character than others. This is a problem for society. It is better that people with questionable character do not acquire a position of responsibility such as running a company. A Board of Directors should consist of people with a good reputation that can impose a community standard on what the company is doing. Tunnelling means that employees take money away from stockholders in a sneaky way. Many tunnelling methods are hard to detect, but are in fact stealing from the company. Employees do not know the stock holders personally, so they may not feel tempted to do this. An example of tunnelling is selling assets of the company at a reduced price to relatives or friends or giving contracts to relatives or friends. Insider trading is another way of defrauding stockholders. Professor Shiller sees serving on a board as a moral obligation to prevent all kinds of misbehaviour. A board member has the duty of care, which means that a board member should act as a reasonable, prudent and rational person. This means, among others, to be watchful and making considerable efforts to get the right information. Board members do not manage the company but they oversee it. Board members also have a duty of loyalty, which is usually seen as loyalty to the shareholders. An example of a trade group is the New York Stock Exchange that was established in 1792. In 1792 the US had a small stock market but no organisation for a stock exchange. The first stock market crash in the US was in 1792 so stock brokers felt the need to organise themselves. They signed the Buttonwood Agreement to set up the New York Stock Exchange. It is often described as an idealistic document about duties and ethics, but the document itself reveals that it was in fact a cartel. The attitude towards cartels has changed over the years. On 1 May 1975 the Securities and Exchange Commission (SEC) made fixed commissions illegal. This move was called Mayday. Until that day members of NYSE had to impose a minimum commission and they could only trade with each other. The justification was that this scheme closed out criminals but it also created monopoly profits. Also in 1975 the National Market System was created by Congress. Now brokers have the obligation to find the best price for their customers on any exchange. The government broke the monopoly of NYSE and there are now many discount brokers. In the UK a similar move was made in 1986 and this was called the Big Bang and it had the same effect. Even today the NYSE has its own market surveillance unit that investigates trading records for examples of manipulation. Airlines used to have their fares regulated by a government agency. Airlines could give a great service because they were competing on service rather than on fares. There were regular flights and good meals but it was expensive. After deregulation fares came down as did service and seat space. Only a few people preferred to pay more for extra service and space. The increased competition is spurred by regulations that eliminated cartels. In the past regulations often were local. For example, local banks were regulated locally. Until the 1930s financial regulation in the United States was almost exclusively local and the federal government did not interfere. During the Progressive Era that lasted from the 1890s to the 1920s many states enacted state regulations on many different fields such as food safety. For finance those laws were called Blue Sky Laws as salespeople for investments of presented a rosy picture of the future prospects of a stock. According to them, the sky was the limit and nothing could go wrong. Kansas started to regulate financial sales in 1911. Inspired by the book Other People's Money of Willian Brandeis that came out in 1914 and detailed scandals about fake securities and dishonest promoters of securities, this development caught on. By the 1930s practically every state had its own Blue Sky Laws and state regulators that enforced them. The problem was that the securities industry was national or even international so clever people could evade the Blue Sky Laws. The spread of the telephone in the 1920s made it possible to set up a boiler room in one state and sell securities in another state. The word boiler room refers to the practise of renting a cheap space, for example the boiler room in the basement of a building, and hiring people to sell worthless securities. The story would be like this: "There is a great stock and it is going to triple in five days. If you do not buy now, it is too late". The Progressive Movement had limited success in regulating securities but if left in place state laws that are still used for the regulation of smaller companies. Under the New Deal in the 1930s financial regulation on the national level took shape. In 1934 the Securities and Exchange Commission (SEC) was set up. It regulates all firms listed on the stock exchange. The SEC also tries to protect small investors by making a distinction between public and private securities. Corporations that want to go public must go through a procedure called Initial Public Offering (IPO). This procedure consists of strict rules dictated by the SEC that make fraud more difficult. Public companies must publish all kinds of documents. The SEC also has regulations for private companies such as hedge funds but those regulations are less strict. A hedge fund is a largely unregulated investment company for wealthy individuals only. The rational is that small investors need to be protected as they cannot pay for advisors. The SEC decided that companies faked their books in too many ways so they decided that accounting had to be managed better but that this was not primarily a government issue. The government then recognised the FASB as an arbiter of accounting standards. The Financial Accounting Standards Board (FASB, nicknamed Fasby) is a private, not-for-profit organisation whose primary purpose is to develop Generally Accepted Accounting Principles (GAAP) within the United States in the public's interest. Those accounting principles are published on Edgar (http://www.sec.gov/...), which is the website the SEC uses for this purpose. The Securities Investor Protection Corporation (SIPC) was created by US Congress in 1970 insures brokerage accounts against losses due to the failure of stock brokers. It was created in response to the failure of the brokerage firm Goodbody in 1970. People that had invested with Goodbody had their stocks in street name and they could have lost money if SIPC had not been instituted. It is similar to the Federal Deposit Insurance Corporation (FDIC) that insures bank accounts against losses due to the failure of the bank. Both are meant to protect small investors so they have limits on the amount they insure. Over time regulations on the national level and in the European Union became stronger. In the US the Dodd Frank Act of 2010 also aimed at the macro economic scale. Many scams to defraud individual investors had already taken care of in previous regulations. The Dodd Frank act created the Financial Stability Oversight Council (FSOC) that deals with systemic risk, which is risk that affects the whole system and it includes issues like too big to fail. Another result of the Dodd Frank act is the Bureau of Consumer Financial Protection (BCFP) based on an idea of Elizabeth Warren. It will be aimed at protecting small borrowers and investors. Elizabeth Warren pointed out that there have been a lot of abusive tactics in finance. Other regulators were not focused on issues like protecting mortgage borrowers and credit card borrowers. They were more focused on disclosure and other issues. In Europe similar moves were made. In 2010 the European Supervisory Framework was instituted. It consists of the European Systemic Risk Board (ESRB) located in Frankfurt, Germany, which is the European counterpart of FSOC, the European Banking Authority (EBA) located in London, Great Britain, is responsible for banking regulations in Europe, the European Securities and Market Authority (ESMA) located in Paris, France, and the European Insurance and Occupational Pensions Authority (EIOPA) located in Frankfurt, Germany. International regulation is a problem but it is very important. People can move their investments to another country with more favourable regulation, such as the Bahamas. Corporations and wealthy individuals tend to move to those countries. An important international institution is the Bank for International Settlements (BIS) located in Basel, Switzerland, was instituted in 1930. It is a gathering of central banks that cannot impose regulation but can give advice on how to run central banks. This has real impact, even though it has not the force of law. The Basel Committee, which was created in 1974, issues suggested bank regulations, such as Basel I in 1988, Basel II in 2004 and Basel III in 2010. Switzerland is the location of international institutions because it has been a neutral country for a long time. The G6 (G7, G8) is the gathering of the finance ministers of six major industrialised nations. They were France, Germany, Italy, Japan, United States and United Kingdom. In 1976 Canada was added and it became G7. The finance ministers coordinated financial regulations. In 2008 the G20 was instituted to reflect the current situation. Most notably China and India have become more important. The career of Mr. Icahn is relevant to course topics like corporate democracy and shareholder empowerment. After graduating from Princeton University, he made a career out of opposing the tendency of Boards of Directors to become complacent. In 1968 he founded Icahn & Company, a securities firm that focused on risk arbitrage and options trading. In 1978, he began taking controlling positions in individual companies like RJR Nabisco, TWA, Texaco, Phillips Petroleum, Time Warner and Motorola. After taking a position in a company, Mr. Icahn became active in the management of the company to change the way they do business. He went to Wall Street in 1961. In a bull market it was easy to make lots of money using leverage. This made him feel that he was a genius because he made more money in two weeks than his father did in two years. He mentor Jack Dreyfus warned him that he would lose all his money. When a crash came in 1962 he was wiped out in one day. He learned from that and became an expert in options and gathered a big following that paid commissions to him. In 1968 he bought a seat at the stock exchange and started to do arbitrage. Today this business is far more competitive because of programmed trading by computers. Arbitrage trades such as buying a convertible bond and short the stocks against them had no risk but there were good profits to be made. What he does today is similar. He buys stock of companies that are cheap relative to the value of their assets. He looks for the reason why the stock is cheap. The major reason is often poor management. He then enforces major changes. Most people in the US do not realise how poorly most companies are run. When you see companies from the inside this becomes more clear. The reason is often lack of accountability and absence of corporate democracy. Mr Icahn himself does not know much about management so he appoints a manager that cuts cost and restructures the company. He thinks that companies are not managed well enough. The United States cannot compete because best and the brightest do not get to the top of the corporate ladder. Mr. Icahn describes the atmosphere in corporations as anti-Darwinian, which means that people are selected for top positions because of their social skills and networking capabilities. In college those people are not so smart but they are good guys. They tend to have a prominent position in the fraternity. Most often they do not speak out on controversial subjects. Those people are often political and astute and know how to get along with people. They do not come up with great ideas. They are never a threat to their superiors. As a result he moves up the ladder because corporate America lacks accountability. He is a survivor and not a threat to others. Finally he becomes the number two. The CEO is like him a survivor and he does not like the number two to be smarter than himself. After the CEO retires the number two becomes the CEO. He also will bring in a number two that is less smart so corporate management has a tendency to degenerate, and in time the country is managed by morons. The US did well despite being badly managed because over the last decades there was a free ride because the US could get cheap goods from abroad which kept inflation in check. Because there was no inflation, the Fed could pump money into the economy. The US could enjoy a good living standard because the rest of the world accepted US dollars. The US has become lazy because the rest of the world accepted the IOUs from the United States. This may be about to change and then the party is over. Also housing in the United States was a bubble like Tulip Mania in Holland in the 17th century which ended in a crisis. Wall Street banks kept issuing different papers against mortgages so they made it simple to get a mortgage. Mortgages were then given to people that could not afford to pay for them. There may be $ 3 trillion of sub prime mortgages out in the market now. Mr. Icahn believes that the problems in the US economy are far from solved and that more problems will be coming in the future. The economy now depends on housing and house prices as people may choose to walk away from their houses so the banks have to take more losses. Mr Icahn also believes that there is $ 6 trillion more debt than the economy can sustain. Even when the debt is repaid, this will curb spending and cause a recession. As a consequence the earnings of corporations may go down and stocks may go down too. Despite that there are great opportunities for Wall Street to securitise and sell companies. For that reason Mr. Icahn sees good career possibilities on Wall Street. Corporate America may be going to learn from this and become more accountable in the years ahead. There are tremendous abuses in Corporate America. A CEO makes 400 times what the average worker makes. The CEOs are simply not worth this money. This can happen because there is no accountability. Shareholders often do not vote because large owners such as mutual funds do not like to vote against these managers. He other activists use their vote to make a change and this can create new career opportunities. Mr. Icahn thinks that more accountability and corporate democracy will provide career opportunities for the brightest people. This is needed for the US to become competitive with the rest of the world again. Derivatives are securities that derive their prices from other prices, often spot prices of commodities and financial instruments. Derivatives markets are more complex than spot markets, which can lead to errors. The financial crisis of 2008 is partly caused by errors people made with derivatives. Warren Buffet called derivatives weapons of mass destruction as errors with derivatives can have a great impact. Professor Shiller believes that society will learn to deal better with derivatives. For example, James Watt resisted the use of high pressure steam as boilers could explode, but in modern society high pressure steam is widely used to generate electricity. For all kinds of technology there are government safety regulations and this can also apply on derivatives. There have been errors made during the financial crisis, but it is possible to learn from them. The theory behind derivatives is mostly mathematical and there are models to calculate their value. Those theories are limited as they do not account for black swan events, which are rare big events . Andrew Redleaf talks about this problem. In 2000 Mr. Redleaf is founded Whitebox Partners, a hedge fund that has now billions of dollars under management. He has to worry about the mathematics of derivatives as well are rare big events. The first futures market started in Dojima in the city of Osaka, Japan during the 1600s. Dojima was the centre of Japanese rice trade. There were 91 rice warehouses in Dojima in 1673. Merchants made contracts to buy and sell rice at a given date. These were forward contracts, which were individual non standardised contracts that could include all kind of specific terms. Forward contracts were not always honoured because prices could change. This made it profitable for one of the parties not to honour the contract but instead to buy or sell in the spot market. Japanese traders then invented standardised contracts for future delivery. Those contracts were traded during designated trading hours. Trading hours were enforced, for example by people throwing water on traders that kept on trading after those hours. Hand signals were invented because the trading floor was noisy. This concept was copied all over the world in subsequent centuries. The problem with non-standardised contracts is that the market price is obscure as specific terms, such as kind of rice and delivery location, influence the price. In a modern agricultural futures market, the contract is to deliver some agricultural commodity like rice at a specified future date at a specified warehouse run by the exchange in a standardised quality. In this way a price for the agricultural commodity becomes available and the futures market becomes the real market for the agricultural commodity, simply because the contracts are standardised while there is no standardised spot market for an agricultural commodity. In forward markets, which are markets between two parties, there is always counter party risk. In futures markets there are margin requirements as an insurance against default on a contract. The margin requirement usually is a percentage of the value of the contract. In the futures market there is daily settlement, which means that wins and losses are added or subtracted from the margin account every day. If the margin account is depleted, you can get a margin call, which means that the broker calls you and asks to put in more money otherwise the position will be closed. In this way there is no risk for the broker or the counter party. Therefore futures prices are pure prices as they do not include counter party risk. This price is called fair value. In theory the futures prices should behave in this way. In reality it is not that simple. A normal situation is called contango, where futures prices are higher than the expected spot price. As times goes on, and the futures come closer to maturity, the futures prices nears the expected spot price. For agricultural commodities, the expected spot price is the highest just before the harvest and the lowest just after the harvest. During the year the price rises because of storage cost and interest until the next harvest. If there is no uncertainty, then the price may move up and down, but the future price for a specific delivery date remains constant. It is less clear whether or not the futures price of the S&P 500 Index is above or below the spot price. If the dividend yield is above interest rate, which it is currently on the short term as the dividend yield is 2% and the short term interest rate is near 0%, then the futures price could be below the spot price. As stocks are always available, the futures price for stock indexes is less interesting than the futures price of commodities such as oil where the supply situation is important. The futures price of the S&P 500 Index only reflects fair value and does not indicate the future price in any way. An option is a right but not the obligation to buy or sell something at a specified price, called the exercise price or strike price until a specified date, called the exercise date. There are call options, which are rights to buy, and put options, which are rights to sell. American options can be exercised at any time until the exercise date. European options can be exercised only on the exercise date. Usually people do not want to exercise an option early as options offer a choice and after exercising the choice is gone. Stock options are the most widely known, but there is also an option element in US mortgages as people can walk away from their mortgage if the price of the house drops below the mortgage principal. It is also possible to pay a mortgage early if interest rates drop, which is also a type of option. Those options affect the price of the mortgage, which is the interest rate. In a sense stocks are also options as they are an option on future dividends. In that case the exercise price is zero. Many people do not see the use of option markets or markets in general. Options exist for a theoretical reason, which is price discovery. In designing the ideal economic system there is need for prices to guide supply and demand. Communism lacked price discovery and this is one of the reasons why it failed. In 1964 Kenneth Arrow wrote in a paper that unless there are prices for all states of nature, the economic system is in a sense inefficient. There is a certain need for a price of everything, including possibilities. Options provide for this. In 1976 Steven Ross wrote that in a sense options complete the state space. Options can be useful in practise. For example, if an entrepreneur has discovered a good location for a new supermarket, he or she could offer the farmer owning the land to pay for an option to buy the land. The farmer may do it but the farmer may already have sold the option. However, the farmer may also have had other offers and may raise the price. In this way options can help in determining the price of this land. Both the entrepreneur and the farmer can learn what the land is worth. In this way the options market can help to determine where the megastore will be located. Options also exist for behavioural reasons. Different aspects of human behaviour are reflected in option prices, such as attention anomalies and salience. Psychological theories about attention anomalies and salience state that specific events attract more attention than others. Options are also often used as an incentive, for example companies give options to buy shares in the company to employees. In that case the stock price attracts the attention of the employees, and becomes salient for them. This may change the motivation at work. Options can also act as insurance and give piece of mind. Buying an insurance is like buying an option. At the expiry date and time, a call option is worthless when the stock price is below the exercise price. The option is out of the money. Nobody exercises an option to buy at a higher price than the market price. When the stock price is above the exercise price at the expiry date and time, the value of a call option is the market price minus the exercise price. The option is in the money. 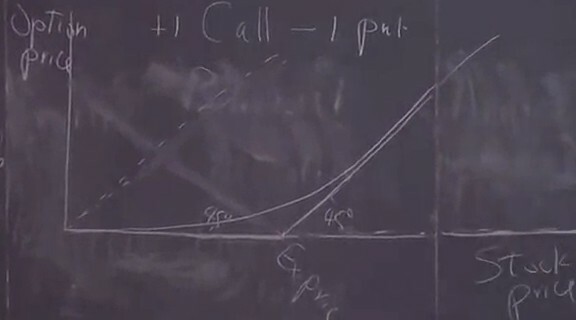 The call option price graph has a broken straight line. People exercise an option that is in the money whether or not they were planning to buy the stock. Similarly, if an entrepreneur has bought an option to buy land that still has value, he or she will sell the option if the plans have changed. stock price = call price - put price + exercise price. stock price = call price - put price + PDV of the exercise price + PDV of the dividends until the exercise date. Options that are out of the money tend to have value before the exercise date because there is a change that they have value at the exercise date. Options have a premium that represents the probability of future prices. Because of the premium, exercising the option early is often not such a good idea as selling the option brings in more money. Therefore the distinction between European and American options is not as big as it seems. The following is an example of simple binomial option pricing . Assume that the stock price of today is S and that the stock price tomorrow can have two values. It can go up to u*S where u = 1 + fraction up or it can go down to d*S where d = 1 - fraction down. Suppose C is the price of a call option with exercise price E and exercise date tomorrow. At expiry tomorrow, the price of the option will be Cu if the price goes up to u*S or Cd if the price goes down to d*S. Consider a portfolio of both the stock and the option that is riskless. The hedge ratio H is the number of shares purchased for every call option sold. The action is to write one call and buy H shares. C = (Cu(1+r-d)/(u-d)(1+r)) + (Cd(u-1-r)/(u-d)(1+r)). This option price is derived from a no arbitrage condition, which means that it is never possible to make more than the riskless rate in a riskless trade. Riskless profit opportunities do not exist, or only for very short time because arbitrage will eliminate them. Similarly, you can assume that there are no 10 dollar bills on the pavement, or only for a very short time because someone will pick them up. The formula does not use probabilities as the price can be derived from the no arbitrage condition only. For example, if the probability of Cu is higher than Cd, the option price would reflect it. The N()-function is the cumulative normal distribution function . The no arbitrage condition also applies here, even though probability may be reflected by the standard deviation σ. The formula can be used in to calculate the right price for an option. On the other hand, by using the market price of the option, it is possible to calculate the implied volatility σ (VIX). The VIX can be seen as a forward-looking measure of volatility. For example, if the prices of call options are high, this implies that according to market participants the probability of exercise is high. Based on calculations Professor Shiller made, the real standard deviation σ turned out to be lower than the expected volatility (VIX). According to Professor Shiller, one cannot assume that people were wrong about their worrying, as things could have worked out in another way. The data indicates that writing options tends to be profitable, while buying them tends to be loss making. This could be expected as taking risk by selling insurance must be rewarded, otherwise nobody will get into this business. Even though there has been high market volatility during a few crises in recent decades, this volatility was benign compared to the Great Depression. Except for the Great Depression, volatility remained remarkably stable and it is about the same now as it was during the 19th century. After the 1929 crash there was a decade of increased stock market volatility. 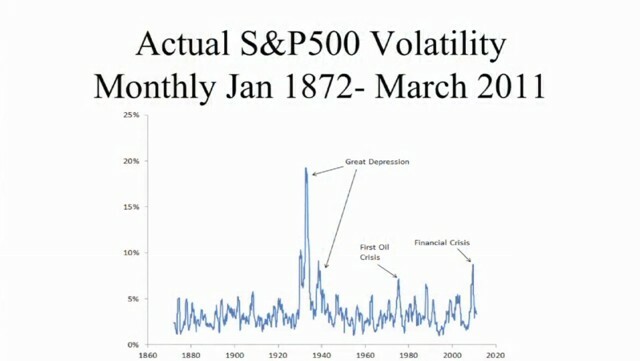 The 2008 crisis shows the second highest peak of volatility, and according to Professor Shiller, another Great Depression has been avoided. 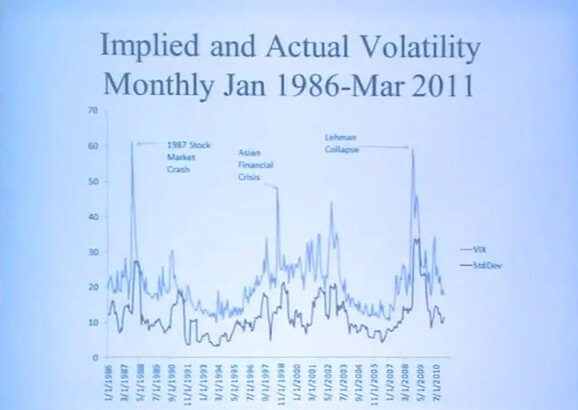 According to Professor Shiller, the chart below shows that the volatility in financial markets tend to be stable for a long time, but black swan events are possible. 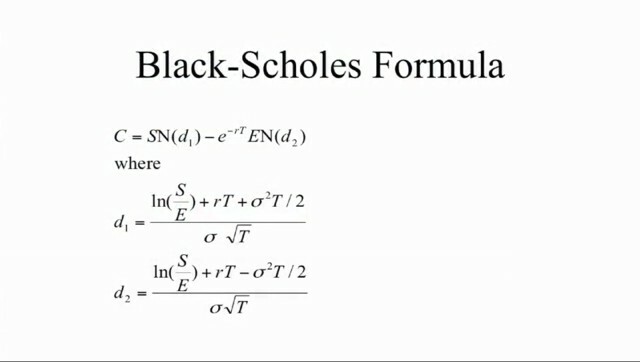 The Black-Scholes options pricing theory does not account for black swan events as it assumes normality of the distribution of stock prices. The options pricing theory thus works well for normal situation, but one has to keep in mind that rare big events can happen, and that the theory may not work at those instances. The first question most people tend to have about financial markets is whether or not they are efficient and incorporate all available information and whether or not it is possible to do better than the market. The predominant academic view is that markets are efficient but there is a strong debate on this issue. The efficient markets theory is based on the theory that people behave rationally and in their own interest. Based on a theory, it must be possible to make predictions, and if they do not come true, the theory becomes invalidated. There are many examples contradicting the efficiency of financial markets. For example, there have been companies like Royal Dutch Shell that has shares that were economically identical but traded at different prices. There have also been closed end funds that traded at a discount or a premium compared to their underlying securities that were also traded at the stock market. There have been companies such as 3Com, that owned a stake in another company, but their total stock market market value was less than the value of their stake. Those anomalies could persist for years. In general less volatile stocks did better than more volatile stocks, which also contradicts the efficient markets hypothesis. There are also a meaningful number of people and institutions that had better returns on their portfolios than the market, which is also inconsistent with the efficient markets hypothesis. Those performances cannot be explained by luck or inside information. Bubbles like the internet bubble and the housing bubble also violate the efficient markets theory. Mr. Redleaf does not believe that markets are efficient and that the evidence is convincing. Doing better than the market is difficult as there are a number of challenges. First, if individuals may have an informational advantage in a specific field, they should not own a diversified portfolio because this would narrow their informational advantage. Institutional and professional investors spend a lot of money on information, but their structure constrains almost everybody. For example, at Whitebox Partners investors can withdraw their funds within 30 days, which constrains the investment options for the institution as all funds can be withdrawn in 30 days. There are also universal psychological challenges, such as biases in thinking. Good decisions may have a mix of randomness and skill. This mix is one of the most serious things for the human mind to process, as it is an unknown mix. Complete randomness is more easy to understand as you can make decisions based on statistics. Narrative events are also easy to understand. An unknown mix of both however is extremely difficult to deal with. People are inclined to do strange things. For example, at the game of poker people often tell in advance that they are just playing the game for fun and are not in it for gains. This may be a psychological mechanism to cope with losses, as they may be losing anyway as there is a sort of randomness in the game, and it may be more easy to cope with the loss when they are not doing their best to win. Really good poker players play close to their best all the time and they are not really bothered when they lose. In financial markets too people look for excuses when things go wrong in advance instead of maximising the chances that things go right. It is really hard to get things right and not set yourself up before the facts to win an argument after the fact that you were just unlucky. People are inclined to see things as determinative, not only in financial markets but also in psychology and literature. This mistakenly believe that correlation implies causality, for example if A happened before B then A must have caused B, so if A happens again then B will happen again. People are inclined to focus on recency even though the information may be irrelevant. For example, in a test people were given the information that two cities they never heard of were 4,200 miles apart. Then they were given the names of two other cities they never heard of and they were asked how far those cities were apart. The answers were centred around 4,200 miles. Mr. Redleaf believes that it is useful to know all the biases people have and to debias your thinking but that is not easy and it may not be your objective. Jim Cramer at CNBC's Mad Money starts out to tell that he does not want to make friends but just wants to make money. For Jim Cramer this may be true. Most people active in financial markets are capable of saying the same words, but they are not true for them as they want to do other things than just making money and want to have friends too. Mr. Redleaf's first principle is dividend. He believes that the investment world consists of coupon clippers, which are people that are interested in cash flow, and security resellers, which are people that own securities to sell them at a higher price in the future. There are successful coupon clippers as well as security resellers and they make money out of the unsuccessful people in the other class. The business of Mr. Redleaf is coupon clipping and getting cash flow like Warren Buffet. On the other hand, there are security resellers like venture capitalists. They often have an idea that may not be that great, promote it well, and resell the stock at a higher price. They have a good sense of what the public will buy. Jim Cramer is also a good security reseller. He spent a lot of effort in finding out what people want to buy next week. He then bought those stocks and promoted them at his show. Mr. Redleaf's second principle is that risk is primarily about the worst thing that can happen. Most risk management at Wall Street is focused on the range of moderately probable outcomes. They discus value at risk (VAR) and many people try to devise VAR systems. They try to determine the bandwidth of outcomes, for example with 95% probability. VAR models that there is a 98% chance of not losing a dollar, but there may be a 2% chance of losing 10 or even 100 dollars. Mr. Redleaf sees VAR as a fundamentally wrong approach that is popular because statisticians are good at it. It is harder to imagine the worst thing that to figure out a bandwidth. Mr. Redleaf's third principle, which is most at odds with the academic views and the general perception, is that you do not get paid for taking risk but you get paid for eliminating risk. He tries to figure out what is the worst thing that can happen and this can be eliminated. He believes that in the history of the planet, there are very few instances of people getting paid for taking risks. A tightrope walker has practised a lot in not getting hurt if he falls down, so he is not paid for taking the risk of walking on a tightrope but for not getting hurt if he falls down. According to Mr. Redleaf, pharmaceutical companies are not paid for testing compounds, but for eliminating compounds to test. They know the chemistry of the disease so they have an idea about what compounds are more likely to work than others. Insurance companies diversify away risk and rely on the law of large numbers. A casino depends on the law of large numbers too. Managing risk, and most notably black swan events, can be essential for survival. The history of banking is a history of disruptions that were devastating for the economy. It is also a history of technological advances in risk management to try to prevent these things from happening again and again. In 1863 the United States passed the National Banking Act that was supposed to prevent financial crises. It was decided that this was not sufficient so in 1913 the Federal Reserve was created. It was modelled after European central banks, most notably the Bank of England. That worked for a while but in 1929 there was another huge crisis that started the Great Depression. It caused a modernisation of the procedures at the FED. That worked for a while but other crises happened and in 2008 there was a huge financial crisis. Now governments and the Basel Committee are devising new measures to cope with this crisis. In 2010 and 2011 new regulations were proposed, which are called the Basel III regulations. They are now implemented and expected to be completed in 2018. Banks need reserve requirements as well as capital requirements. The guest speaker is Lawrence Summers who is a Professor at Harvard University and a former US Treasury Secretary. He talks about the nature of financial crises that we have seen since around 1980. He has a list of seven major crises, starting with the 1987 stock market crash. He argues that the nature of crises is changing and that is why regulators are caught off guard. According to him the extraordinary success of the existing policies caused the emergence of crises of a different kind. Similarly, medical research eliminated infectious diseases so more people now die of cancer. Innovations in regulations made the banking system more stable. After World War II there were relatively few financial crises until 1980. Then they came back in a different form. Complacency has contributed to this. People started to take risks in other dimensions because the financial system seemed safe. It is therefore critically important to update regulations as financial technology is progressing. Financial technology can make the world a better place if it is regulated properly. Regulators have to be on the watch for new risks that emerge. The basic business of banks is borrowing at a lower interest rate and lending at a higher interest rate. This spread is their core income. Traditionally, banks issued notes, which are paper money. This role has been shifted to the central banks. Only in the United Kingdom and Hong Kong private banks still issue bank notes. Banks offer liquidity by borrowing short term and lending long term. Banks offer deposits that can be cashed in at any time and offer longer term loans, for example 30 year mortgages. If all depositors demand their money at the same time, this is not possible so the banking system had crises from time to time. The oldest surviving bank is the Banca Monti dei Paschi in Sienna, Italy, that was set up in 1472. This bank started as a philanthropic institution to lend money to the poor. Wealthy donors gave money to set up this bank. In the 1600's the bank already had deposit insurance as the Duke of Sienna guaranteed all deposits. In 1907 Clive Day, a former Professor of Yale, wrote a book called History of Commerce. His history of banking began in England with the goldsmith bankers in the 1600s. The goldsmith bankers issued notes against gold that people deposited in their vaults that could be used as money. In this way paper money was invented. The goldsmiths then started to lend out the gold in the vault because nobody came for it. They did not have to pay interest on the bank notes, making it a profitable business. Commercial banks take deposits and make loans of various kinds, mostly business loans. Historically they did not offer mortgages and consumer loans. In 2010 the total assets of commercial banks located in the US was $ 14.6 trillion. Only $ 10.1 trillion was from US chartered banks. Savings banks were originally set up for lower income people to encourage thrift as commercial banks did not take small deposits. In 2010 their assets were $1.2 trillion. There are also credit unions that are a kind of clubs. In 2010 their assets totaled $0.9 trillion. Both savings banks and credit unions were active in the mortgage business. The Diamond-Dybvig model is a theoretical model of banks as providers of liquidity . Liquidity is an economic good that you can get for nothing. Liquidity appears as a function of banking and this makes the lives of people easier. The model has multiple equilibria, a good equilibrium and a bad equilibrium, depending on expectations. If people expect that the banking system is sound, it will work well, but if people change their expectations it can fall apart because of a bank run. Douglas W. Diamond and Philip H. Dybvig provided an economic rationale for deposit insurance as it helps to provide a good equilibrium. Banks solve an adverse selection problem. The public is not very good at estimating the value of the loans. There is an adverse selection problem as the good loans end up in the hands of the experts and the bad loans are offered to the public. Banks can solve this by having local loan officers in the community that know the borrowers. Banks also solve a moral hazard problem by constantly monitoring the behaviour of corporations. Loans are officially short term but effectively long term because they are often renewed. Banks do not renew the loans if they suspect that the company doing something that implies moral hazard. There is a long history of governments backing up the deposits at banks in order to prevent bank runs. There had been many bank runs based on rumours. Sometimes those guarantees could become expensive and the insurance scheme would fail. Before the Federal Deposit Insurance Corporation (FDIC) was instituted in 1933 as part of the New Deal, many local and state governments had deposit insurance, and many of those schemes failed. The FDIC never failed as there never had been a big bank run since 1933. People may have stopped worrying about their deposits because they were insured. The Federal Savings and Loans Insurance Corporation (FSLIC) did fail during the savings and loans crisis in the 1980s when there was a widespread failure of savings and loans associations. The FSLIC could only cover a part of the losses and went bankrupt. The US government then stepped in to the amount of $ 150 billion and that restored confidence. Savings and loans are now insured by the FDIC. When banks are insured they must be regulated because there is a moral hazard problem. Banks may be tempted to take risks to generate more profits because the deposits are insured and depositors are not likely to withdraw their money. The Basel regulations are all about banks having enough money to handle the risks they take. In 1988 Basel I introduced risk weighted assets and based capital requirements on them. Basel I identifies four categories of assets: 0% weight, 20% weight, 50% weight and 100% weight. A higher weight means riskier. 0% is for government bonds from countries that are member of the Organisation for Economic Co-operation and Development (OECD). Those bonds are considered to be riskless. 20% is for municipal bonds or local bonds issued by city or state governments, but also government mandated enterprises like Fannie Mae and Freddie Mac. At that time Fannie Mae and Freddie Mac did not invest in sub-prime mortgages. 50% is for home mortgages. 100% is for everything else, most notably loans. The requirement of Basel III is that common equity must at least be 4.5% of risk weighted assets at all times. Capital conservation buffers must at least be 2.5% of risk-weighted assets in order to pay any dividends. Effectively, Basel III thus recommends a capital requirement of 7%. Basel III also recommends a counter cyclical buffer of 2.5% that can be implemented by the regulators of a country on their own discretion to deal with a bubble. Basel III recommends implementing this measure when the economy is still booming, as increasing capital requirements during a bust can make things worse. For example, a bank with $400 million in assets, of which $100 million in government bonds, $100 million in municipal bonds, $100 million in mortgages and $100 million in commercial loans has $170 million in risk weighted assets (RWA). The required capital of the bank including capital conservation buffers is $11.9 million, which is 7% of $170 million. Banking crises have happened throughout history. The Mexican Crisis was in 1994-1995. The Salinas government privatised Mexican banks but they were not adequately regulated. This led to a lending boom. In 1988 lending was 10% of GDP. In 1994 it had risen to 40% of GDP. The Asian Crisis was in 1997-1998. International banks had lent a lot of money to Asian countries. International investors suddenly wanted to withdraw their money. It started in Thailand, Korea and Indonesia and spread over the world. The Russian Debt Crisis of 1998 was caused contagion. Also Brazil was affected. In 2002 there was the Argentine Crisis. Central banks are government banks that are responsible for the currency of the country. The US was on the gold standard until 1971. This caused problems as the bankers did not always meet their obligation to redeem deposits in gold. The Bank of England was founded in 1694. It was a bank with a special charter from the British government that gave it a monopoly on joint stock banking, which is issuing shares and selling those shares to a large number of people. There were other banks but those were partnerships with a limited number of partners. The Bank of England became the dominant bank in the United Kingdom. The Bank of England realised that it had a lot of power and could put the smaller banks out of business. The Bank of England received notes of other banks and could present them all for payment and no bank had enough gold to fulfil the request. The Bank of England however assumed the role of a non official government bank and forced other banks to keep deposits at the Bank of England. This created stability as the Bank of England had the money to bail other banks out if needed as other banks kept deposits there. This became the model for central banks all over the world. In 1863 the United States passed the National Banking Act that aimed at getting some of the advantages of a central bank without founding one. A new kind of bank called national bank was invented. Those banks were required to keep deposits with the treasury capital to back their national bank notes. Those bank notes were printed by the government and all looked the same, except for the name of the bank that was on it. This was a success. All national banks would honour each other's notes at par, so there was no problem with discounting them. There were still banking crises but this was not caused by a failure of the bank notes. There were still runs on banks, for example in 1893 and 1907. In 1913 the United States did get the Federal Reserve System (FRS), which is a central bank with twelve regional branches. The Federal Reserve Board is located in Washington DC. It oversees the regional Federal Reserve Banks. The Federal Reserve System required banks to hold currency in their vaults or deposits at their local Federal Reserve Bank to back up their currency. Those reserves are also called high powered money. In the case of an emergency they could use their deposits at the FRS or the FRS could rescue them. The Federal Reserve System became the lender of last resort that operated the discount window. A bank that was in trouble could go to the discount window and bring securities as collateral. The FRS then discounted the collateral brought in by the bank and lend money. The central bank controls the system through reserve requirements. Banks must keep a certain amount of reserves, which are deposits at the central bank and currency in their vault. After 1929 the system broke down as banks started to fail. This banking crisis reached its peak in 1933 when the banking system was in total disarray. President Roosevelt shut down the entire banking system in the United States in a banking holiday as there was a catastrophic bank run. The Roosevelt Administration also instituted the Federal Deposit Insurance Corporation (FDIC). Previous instances of deposit insurance have often failed. The US did not have another major banking crisis since 1933 until 2007. Deposit insurance has been a key factor in this. The FED began to give itself a role in stabilising the economy and preventing recessions. When the economy was overheating and inflation was building up, the FED raised interest rates. The high interest rates were meant to cool down the economy. If the economy became weak, the FED lowered interest rates to encourage borrowing and spending. In 1992 the Maastricht Treaty was signed to create the European Union. It also had a plan for the creation of the single European currency, the euro . The euro started in 1999 and the currency was issued in 2002. The European Central Bank (ECB) was founded in 1998 and is located in Frankfurt, Germany. The countries that participate in the euro are also called Eurozone countries. Every country in the Eurozone still has its own central bank but they do not maintain a currency any more. The Bank of Japan became independent in 1997. This is part of a movement to make central banks independent. The FED was designed to be separate from the government. The reason is that the government may want to inflate the currency. Politicians may try to influence the central bank. The Board of Governors of the FED has 14 year terms to reduce government influence on the central bank. The Federal Open Markets Committee (FOMC) meets once a month. They issue a statement after each meeting. The FOMC decides on a range for the Federal Funds Rate, which is an overnight interest rate that is charged on unsecured loans without collateral between banks and other financial institutions. There is some risk, but usually banks trust each other overnight. Until recently banks did not receive interest on the reserve accounts they held at the FED. This changed in 2008 with the Emergency Economic Stabilisation Act (EESA), which allowed the FED to pay interest on accounts held at the FED. In the past the FED managed the Federal Funds Rate by buying and selling Treasury bills in the open market. Because markets are interlinked, this affected the supply and demand for short term credit and indirectly targets the Federal Funds Rate. After the financial crisis of 2008 this changed. Regulation D specifies how much reserves banks have to hold as a function of their liabilities. Reserve requirements are 10% of transaction accounts, such as checking accounts, NOW accounts and ATS accounts. Those accounts are instantly withdrawable. There are also time deposits, which are savings accounts that are not instantly withdrawable. Reserve requirements are still based on old thoughts about preventing bank runs. For time deposits there is no reserve requirement. The money multiplier is approximately (1/reserve requirement). So if the reserve requirement is 0.10 (10%) then money supply can be 10 times the reserve requirement. Currently this has become irrelevant because banks are holding excess reserves. Before the financial crises there were hardly any excess reserves because banks did not receive any interest on them. At that time the money multiplier did work. Now the interest on reserves is 0.25%, which is more than banks can get in the Federal Funds market. Capital requirements are more important now. They are emphasised in Basel III. Basel III is not in force yet. There is a phase in period that lasts until 2019. Banks have to hold capital as a fraction of their Risk Weighted Assets (RWA). The G20 countries have agreed on Basel III, but each country has to work on its own implementation of Basel III. The US has a problem as Basel III refers to credit ratings while the Dodd Frank Act of 2010 abolishes the used of credit ratings by the government. Basel III is a complicated set of rules about common equity requirements. Now follows a simplified example. Suppose a new bank has been set up and the first depositor arrives and deposits $100. The bank then has assets of $100 and liabilities of $100. If it is a savings account, there is no reserve requirement. If it is a transaction account, the reserve requirement is 10%. The reserve requirement is met. Cash has a 0% weight so RWA is 0. If the bank wants to make loans, then the capital requirement must be met. Basel III requires that common equity must at least be 4.5% of risk weighted assets at all times. Capital conservation buffers must at least be 2.5% of risk-weighted assets in order to pay any dividends. Effectively, Basel III thus recommends a capital requirement of 7%. To satisfy capital requirements, the bank may issue $20 in shares, which brings in a common equity of $20 and another $20 of cash on the asset side. There are no loans so RWA is still 0. The next step is to make corporate loans of $100. RWA is $100 so the required capital is $7. The bank now satisfies reserve requirements as well as capital requirements. Now suppose that $15 in corporate loans default. Then common equity becomes $5 and the bank does not satisfy capital requirements any more as they are now $5.95, which is 7% of $85. It still satisfies reserve requirements as there are $20 in cash while $10.50 is required. The bank can attract new capital or sell some of its loans to meet capital requirements. The Basel III capital requirements are meant to stabilise the system. A bank that has enough capital will not go bankrupt even when some of their loans default. A problem is that banks respond to a crisis by issuing shares or selling loans to meet capital requirements. Both are hard to do during a crisis as everybody is trying to do the same at the same time, causing a collapse of the system. This is what happened during the financial crisis of 2007-2009. In recent years financial crises have become pervasive. There had been six or seven major financial crises related to the United States: the 1987 stock market crash, the 1990 savings and loans crisis, the 1995 Mexican crisis, the 1997 Asian financial crisis, the 1998 LTCM/Russia crisis, the 2001 Nasdaq/Enron/high yield crisis and the 2007 mortgage and credit crisis. An interesting question is whether or not there is a relation between all those events. In the preceding generation financial crises where relatively rare and business cycles were caused by the FED's concerns about inflation. During the last generation, business cycles have been associated with financial crises and the FED has not caused downturns trough its concerns about inflation. Larry Summers thinks that the previous generation achieved credibility in non inflationary monetary policies that enabled inflation expectations to be kept in check. Just as success in curing infectious disease leads to more cancer, the achievement of low inflation leads to an economy where expansions are enabled to continue until they lead to the complacency and confidence associated with financial crises. In recent decades there have been frequent financial crises that often lead to disruptions in the economy. The causes of financial crises should generate more attention of macroeconomics than they had before. Economic downturns can be seen as a reduction in aggregate supply, so it is likely that a better management of financial crises and the prevention of financial crises will not only lead to a smoother path of economic output, but also a path that, by avoiding economic downturns, has a higher average over a longer period of time. Discussions on financial crises tend to have the character of accident investigations. There are a great number of suspects and many details under investigation. There are always words associated with particular crises, such as portfolio insurance with the 1987 crash, bubble psychology with the Nasdaq crash or the separation between the originators and owners of mortgages with the sub-prime mortgage crises. The financial infrastructure consists of the buy-side, the sell-side and in-between. The sell-side are the people who are in the business of selling securities. The buy-side are the people who are in the business of investing in securities. In-between are brokerage firms and dealers. On the sell-side operate investment banks that specialise in helping firms and government bodies to issue securities. They have relationships with potential buyers of securities. Investment banking became a unique and separate business in the United States after the Glass-Steagall Act of 1933 that forced banks to choose to become either a commercial bank or an investment bank. That has changed after 1999 and now commercial banks have investment bank divisions. Bear Sterns and Lehman Brothers were an investment banks that failed during the financial crisis. A number of investment banks merged with commercial banks or opted to become a commercial bank in order to receive emergency support from the FED. Despite the demise of the investment banks, investment banking remains an important type of business. They publicise information about investments, which makes financing possible. On the buy-side are the money managers that invest other people's money as a profession. The stock market increasingly has become the domain of professionals because people realise that they need professional help on deciding on investments because financial theory has become more and more advanced. The in-between are the brokers, the dealers and the exchanges. Exchanges used to be human with brokers meeting on a floor. Now trading has become electronic. The business itself remains the same, which is to help bring people together to make a trade. The guest speaker is Stephen Schwarzman. He is a co-founder of the Blackstone Group. The Blackstone Group is an American multinational private equity, investment banking, alternative asset management and financial services corporation with $200 billion of assets under management. It should not be confused with the Blackrock Group that has more assets under management and offers it services at low cost to the general public. Blackstone is concentrated on a smaller number of investments and achieves very high returns. Blackstone recently launched a new type of security called REO-to-rental, which is based on foreclosed homes. Stephen Schwarzman shares his thoughts about efficiency of markets and whether or not it is possible to beat the market. Schwarzman has practical intelligence and wants the information to have sense of what one needs to know to figure out investments. Investment banking is the business of helping other organisations, which can be businesses, governments or non-profits, to create securities such as stocks and bonds. Part of the investment banking business is consultancy. An important business of investment banks is underwriting of securities, which is managing the issue of new securities. A pure investment bank does not accept deposits or issue loans like a commercial bank. When a corporation is issuing shares for the first time, this is called an initial public offering (IPO). A seasoned offering is a share issuance for a company that is already public. It is a bought deal when the investment bank buys the shares and tries to resell them, It is called best efforts when the investment bank only tries to place the offering. Those deals are regulated by the Securities and Exchange Commission (SEC) and regulators in other countries. An important part of investment banking is solving a moral hazard problem. Companies that issue shares may not have reputation and may issue shares and then go bankrupt. An investment bank does a due diligence and checks out the company. Investment banking is about establishing trust. In 1933 US Congress passed the Glass-Steagall Act which separated investment banking from commercial banking. The act also created the Federal Deposit Insurance Corporation (FDIC) and it made sense only to insure commercial banking. Investment banking was seen as risky business. JP Morgan picked commercial banking. Their investment bankers were fired and regrouped in Morgan Stanley. The Gramm-Leach Act of 1999 repealed the Glass-Steagall Act. During the financial crisis the Glass-Steagall Act was brought up again as it seemed that the crisis related to a number of frauds in the financial sector. The government had to bail out commercial banks. The banks were involved in different kinds of activities and the public was insuring them. Outside the United States this separation never existed. Banks outside the US were universal banks that did commercial banking as well as investment banking. The Gramm-Leach Act meant to eliminate the competitive disadvantage of US banks. The former chairman of the FED Paul Volcker proposed the Volcker Rule, which is now included in the Dodd-Frank Act. It prohibits proprietary trading at commercial banks. Proprietary trading is trading stocks, bonds, currencies, commodities, their derivatives, or other financial instruments with the firm's own money, as opposed to depositors' money, so as to make a profit for itself. For that reason commercial banks cannot own hedge funds or private equity. Commercial banks cannot deal in swaps any more as swap dealer are barred access to the FED. Goldman Sachs had to become a commercial bank and because of the Volcker rule it has to shut down its proprietary trading, which was generating huge profits for them. It is not clear whether or not that will happen as it depends on how Dodd-Frank is enforced. It is likely that they will work around it. The amount of rules guiding finance is enormous. The laws are difficult to understand for ordinary human beings. Shadow banks are organisations that act like commercial banks but are not, so they do not have to comply with all kinds of regulations. The investment banks were often shadow banks. For example, Lehman Brothers and others were financing many proprietary investments, such as investments in sub-prime loans, by issuing repos. The banking crisis was for a large part a run on the repos, which means that they were not renewed. A repo is a short term loan in which the borrower sells a security and guarantees to buy it back at a later date. Dodd-Frank regulates this kind of activities. Investment managers are trained in modern finance and understand risk management. Investment managers and risk managers have a fiduciary duty to act in the interest of the people for which they manage investments. The law tries to prescribe what this fiduciary duty is. The Prudent Person Rule means that an investment manager should act like a prudent person. The Employee Retirement Income Security Act (ERISA) is an act of Congress from 1974 that describes this rule for pension funds. The definition of a prudent person remains vague. This act created a fear amongst institutional investors to use unconventional investments. For example, because of the Prudent Person Rule university endowments were invested in government bonds for much of the 20th century. However some endowments took a more aggressive approach. The Yale endowment invested in dot.com stocks and sold out at the peak. In general the interpretation of Prudent Person Rule has become more benign and allows for aggressive investing. This also helped to create a bubble in certain types of investments. The Dodd-Frank Act of 2010 uses the term prudential standards. It seems that society desires more government regulation for institutional investors. The Prudent Person Rule did not work very well as it left room for interpretation. At first the interpretation was strict, but later it became loose, which helped to create a financial crisis. The Dodd-Frank Act instituted the Financial Stability Oversight Council (FSOC) that can make recommendations on prudential standards, most notably regarding leverage. Before the financial crisis the economy became increasingly leveraged. The role of setting prudential standards now has become largely a government affair, also because rating agencies have not done their work properly. Financial advisors do not directly manage portfolios but they give advice to those who do. Financial advisors are regulated by governments in most countries. In the United States the SEC requires financial advisors to be approved by the Financial Industry Regulatory Authority (FINRA). It is a self-regulatory organisation, a non-governmental organisation that performs financial regulation of member brokerage firms and exchange markets. The National Association of Personal Financial Advisors (NAPFA) manages the relation between fee-only financial advisors and the public. Financial planners do not need a licence from FINRA. There has been much bad advice and people have been advised to leverage up on the ownership of their homes and borrow heavily to buy second homes. There is a concern about the advice given. Mortgage brokers give advice on getting a home mortgage. There was no licence required for them until the financial crisis. The financial world is becoming more and more complex while advisors are not always giving good advice. There is a trend towards an increasing professionalisation of those groups. Pensions are a relatively new phenomenon. In the past elderly people were depending on their children, but if they had no children that supported them, they were left on the streets to beg. The first US pension plan was in 1875 when American Express Company, which was a delivery company with stage coaches, set up a pension plan for its employees. Retirees could get 50% of the average pay during the last 10 years for life if they passed age 60, worked there for 20 years and became disabled. In 1901 Carnegie Steel created the first large industrial pension fund. Unions also set up pension funds in the early 20th century. After 1929 pensions collapsed as companies went out of business. The pension funds of the unions failed as they had not managed their money well. This led to further thinking about pensions. The General Motors Pension Plan of 1950 became the first fully funded pension plan. GM created a trust for the employees that did not depend on the fate of General Motors itself. Studebaker was an automobile manufacturer that went bankrupt in 1963. They had a pension plan that was not adequately funded and the employees lost a part of their retirement. The unions did not manage this well so the government enacted ERISA in 1974 to manage pensions better. ERISA set up the Pension Benefit Guaranty Corporation (PGBC) insures the funding of pension plans. Pensions plans have to undergo checks by the PGBC to ensure that they are fully funded. Pension funds also must pay an insurance premium to the PGBC. If the plan turns out not to be fully funded, the PGBC can replace the lost income. At the time ERISA was conceived, defined benefit plans were the norm. It was a challenge for the pension funds to finance a fixed pension as it was difficult to calculate how much money must be put aside. In the 1980s many companies switched to defined contribution plans, such as 401K, that do not make specific promises. Portfolio managers defined contribution plans do not have to worry about targets. Often the employee can choose a main allocation between stocks, bonds and real estate. Those categories of investments are then often managed by investment managers. A problem with defined benefit plans is that they are not mandatory. Usually companies ask employees to make a contribution which is then matched by the employer. 25% of the people opt out and have no pension. There are also people that make bad investment choices. Exchanges are places where securities are traded and they are central to economics. A broker acts on behalf of others as an agent to earn a commission. A dealer acts on his or her own behalf as a principal to earn a spread or markup. Stock markets can be a dealer market and a broker market. The New York Stock Exchange (NYSE) is a broker market or a continuous double auction market where brokers facilitate trades. The NASDAQ, which is an abbreviation for National Association of Securities Dealers Automated Quotations, is a dealer market. The Dutch VOC was the first publicly traded company in 1602. In 1698 people started to post stock prices on the wall of Jonathan's Coffee House in London, which was the beginning of the London Stock Exchange (LSE). In 1792 stock brokers signed the Buttonwood Agreement under a buttonwood tree to set up the New York Stock Exchange (NYSE). In Bombay, India, traders met under a banyan tree in the 1850s. In 1875 the Bombay Stock Exchange (BSE) was founded. The Sao Paulo stock exchange was founded in 1890. The Mexican stock exchange was founded in 1894. Traditional stock exchanges have a trading floor where brokers meet. There are corners for each stock. In recent decades electronic trading and electronic exchanges are becoming more important. For example, in India the National Stock Exchange (NSE) was founded in 1992 as an electronic exchange. In China the Shanghai and Shenzhen stock exchanges were founded in 1990. In the 1970s NASDAQ was founded. At that time the NYSE was dominant and prestigious. Any corporation that wanted to be listed there had to conform to high standards. The company had to have a history of earnings and a specified corporate structure. Startup companies could never be traded at NYSE and were often traded over the counter (OTC), which means without an exchange. The brokers held records of those transactions that were called pink sheets. 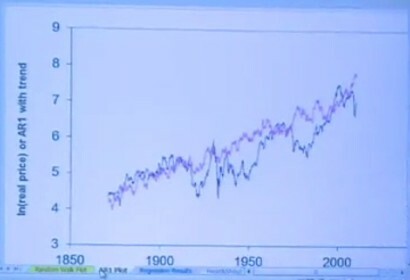 To reduce the telephone activity, the computer system NASDAQ was introduced. The NYSE itself was not a laggard in innovation. They sent telegraph messages with stock quotes and used tick tape machines that printed stock prices, an invention of Thomas Edison in the 1870s. The ticker tape was just a record of trades and it did not help the trades. NASDAQ created an order book that was visible to everyone trading on NASDAQ. NASDAQ has levels of visibility of the order book for which it charges fees. Level I is just the spread of bid and ask. Level II gives more insight in the order book that includes different exchanges. There are different types of orders: market orders that do not have a price limit and limit orders that have a price limit, which is a maximum price for a buy and a minimum price for a sell. A stop order is executed at any price when a limit is reached. It can be a sell at any price when the price goes below the limit or a buy at any price if the price goes above the limit. If the limit is not reached before the expiration date of the order, the order will not be executed. It is also called a stop loss order as it is often used to limit the potential loss on a position. The order book example is a level II example. Level I only gives the inside spread, which is the first row of both sides. 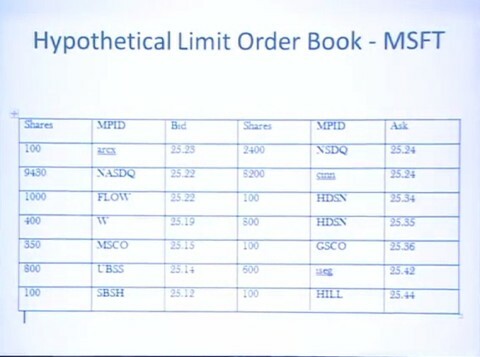 The limits in the order book show that no trade is possible. This is a normal situation because trades that are possible are made instantly and disappear from the screen. Level II gives more information, for example that it is unlikely that the price will drop significantly short term because there are big buyers in the order book just beneath the inside spread. In reality the number are changing quickly as trading goes on. In a fully automated system trades are executed automatically. This facilitated the emergence of high frequency trading (HFT), which is trading done by computers. It is also called programmed trading or algorithmic trading. It started in the 1970s and became important during the 1980s. Currently there are millisecond strategies and orders that only last 1/1000th of a second. Millisecond trading favours electronic exchanges so floor exchanges are becoming extinct. Electronic trading started when electronic communication networks (ECNs) were allowed by the SEC as alternatives to stock exchanges. Stock exchanges are highly regulated by governments around the world. Important ECNs where Island and Archipelago, which were websites where the public could trade. The ECNs had a web culture, which meant no charges for many things including the order book. NYSE did not take this development seriously at first, but later NYSE merged with Archipelago. Much of their trades now flow through Arca. Mr. Schwarzman graduated from Yale in 1969. He graduated from Harvard Business School in 1972. He became managing director at Lehman Brothers and became head of the global mergers and acquisitions team. In 1985 he founded the Blackstone Group with Peter Peterson. The Blackstone Group became the lead manager of alternative assets. Their return on private equity investments was 23% per year on average for the last 20 years after fees. Their real estate group even managed to make 30% per year on average for the last 15 years. They were planning to buy $12 billion of leveraged loans from Citigroup at a steep discount. Finance was not an important subject around 1970. Securities markets were regulated and commissions were fixed. It was a rigged system without much competition. Business in general was unfashionable as there was an anti-business sentiment. Mr. Schwarzman felt lucky to be hired by Donaldson Luufgen and Genrad (DLG), which was a NYSE firm that had just gone public. He did not even know what common stock was after he graduated. He also could not read a financial statement but he had to interview executives of corporations to make investment decisions. His first interview went not well as he asked questions the executive was not allowed to answer. His questions amounted to requests for inside information. Mr. Schwarzman soon figured out that this was bad business as he could not acquire the relevant information to base decisions upon. He then went to Harvard Business School in the hope of getting more information on how this game works and how he could prosper in it. He learned that a company is an integrated system. A good company integrates information. For example, if you want to develop a product, there must be someone willing to buy it. His career has been about getting the right information about what is going on. In the private equity business this is possible as the stocks of the companies are not publicly traded. It is also possible in the real estate business if you sign a confidentiality agreement in which you state that the information can only be used for deciding on the price you want to buy the business. He also needed the information to decide on how to improve the company. The business of Blackstone Group was buying companies with debt, typically in a 3 to 1 leverage, which is 75% debt and 25% equity. They the improved those companies with a range of managerial actions. Those companies then grow with the economy and the leverage will generate a much better return. If the company is improved and grows faster than the economy, the return is even far better. The return after fees was 23% on average, but before fees it is 31%. This was high compared to the stock market return of around 11%. Blackstone Group is also in the real estate business, which is easier because buildings do not talk, so there is no need to figure out what has been said. A building cannot mislead you. Corporations are more complex as there is global competition. The supply and demand for real estate can be figured out in a more easy way. The returns in real estate therefore have been better. They earned 30% after fees or 40% before fees. The alternative class real estate can be much better investment if handled right than regular financial market investing. When Blackstone Group was founded, institutions on average had less than 1% invested in private equity. Now it is about 4.5%. Returns are so much higher so Mr. Schwarzman wonders why not more money is allocated in private equity. His projection is that private equity will grow at a faster rate than average investments in the future. Yale has around 17% in private equity in this is one of the reasons why the Yale endowment has done much better than the market. An abnormal issuance of sub-prime securities is caused by a government law to offer housing to low income people that normally cannot afford a home and pay back the principal with interest. In 2002 the percentage of sub-prime loans issued was 2%-3%. By 2006 this percentage had exploded to 30% of all mortgages issued that year. In the old days people had to put up 25% of the value of the house. For sub-prime loans often nothing had to be put up and no interest had to be paid in the first few years. Now many people cannot afford to pay the interest and default. These mortgages were pooled in new securities that were rated triple A by the rating agencies. Triple A means that there is no chance of default. It is a mystery why those securities were rated triple A and were bought everywhere. They were exported throughout the world and created enormous problems for institutions around the world. In the US financial institutions lost hundreds of billions of dollars. As part of Sarbane's Oxly introduced after Enron, fair value accounting (FAVS 1507) was introduced. As a consequence, securities were marked down before defaults even happened, on the expectation that defaults were going to happen. Financial institutions then had to take a loss based on the expected value. As a consequence the financial markets started losing confidence in the financial institutions and the asset classes of those financial institutions such as stocks and bonds. There were margin calls and hedge funds had to sell those securities. This created a downward spiral of deleveraging and panic selling. This melt down caused banks to stop lending money to asset classes such as leveraged lending. The cost of credit increased by 3% to 4% and this resulted in a financial crisis. The FED quickly lowered interest rates and agreed to lend huge amounts of money to the banking system as banks did not want to lend money to each other any more. This also impacted the lives of ordinary people as there is less money for businesses and consumers to borrow. This could trigger a recession, which happened in the United States. Public finance is finance for governments, such as national governments, regional governments and municipalities. The difference between public and private organisations is not always clear. Sometimes they are in the same business, for example there are public schools and private schools. The voting rights are different. In a corporation it is one vote per share but in a municipality every adult has one vote. A non-profit company can make profits but differs from a for-profit company by not distributing profits. Non-profit companies often have a social or environmental purpose. Benefit corporations are halfway between for-profit and non-profit. There are also cooperatives, which are groups of people working together in organising a business activity. Those companies also need financing. Communist countries like the Soviet Union and China have become capitalist countries in recent decades. Professor Shiller attributes the immense growth of living standards around the world to financial capitalism. A good society is based on the golden rule, which is that one should treat others as one would like others to treat oneself. People should be generous and kind as human society is based on caring and purpose. As financial capitalism spreads, the role of finance and power in giving power to certain groups is questioned. There is a concern that inequality is getting worse as a consequence of financial capitalism. People have learnt that excessive aggressiveness does not pay. This also applies to finance. Civilisation sets up a game to play and humans can set the rules of those game so it can be a fair game. However, there must be some competition and creative destruction. A non-profit is an organisation set up for a charitable cause and has no owners. Profits go back to the organisation for its purposes. It has a Board of Directors. In 2010 there were 1.6 million non-profits in the United States and they accounted for 4% of GDP. Non-profits are important in the United States as the government has a limited role in the Constitution. Professor Peter Tufano founded Doorways to Dreams to help people with personal finance. Professor Dean Karlan created Innovations for Poverty Actions aimed at alleviating poverty. Yale Professor Bill Draytor set up the Ashoka Foundation to encourage social entrepreneurs. Wendy Kopp founded Teach For America (TFA), a national teaching corps of young people who just graduated from college. Governments impose regulations on for-profits and non-profits. Most countries have a corporate profits tax, which can be seen as a partial nationalisation of all corporations in the country as the government is collecting from their profit as if it was a shareholder. In the US this tax is 35% federal and up to 12% local depending on the state. For Canada those numbers are 16.5% federal and 16% local. Other tax rates: Japan 40.6%, Brazil 34%, China 25% and India 33%. The rationale for a corporate profits tax is that corporations do not exist in isolation but depend on society to make their profits. [the lecture now takes an unexplained turn] During the financial crisis General Motors filed for bankruptcy using chapter 11 of the Bankruptcy Code. There are two ways to file for bankruptcy. Chapter 7 is liquidation. Chapter 11 is continued business. The US and Canadian government then invested in General Motors. State and local governments spend twice as much money as the federal government. They run public schools, fire departments, police departments, parks and many other things. State and local governments often need to finance projects. States and municipalities have a balanced budget rule, which means that they must tax people for all their operating expenses. States and local governments have an operating budget and a capital budget. State and local governments can borrow for their capital budgets, for example for building a school. Expenses for city expansion, such as building roads and sewage systems, can be paid for by the capital budget as it can be paid for by future tax income. Municipalities can also go bankrupt using chapter 9 of the Bankruptcy Code. Municipalities do not have shareholders but they have an ability to tax people. Many municipalities have a Rainy Day Fund in which they accumulate assets to cope with difficult times. Recently most of the Rainy Day Funds have been exhausted. The Great Recession caused municipal tax income to decline and there is an increased worry about municipal bankruptcies. Municipal bonds were popular because their interest was tax-free. Often governments provide social insurance, which is insurance that is often not available through private insurance companies. Progressive taxes combined with the Earned Income Tax Credit (EITC), which is a negative tax rate on low incomes, are meant to reduce the effect of income shocks, which is a form of insurance. The EITC is only for working people and it is higher for people who support a family. Public services, such as education, are paid for by taxes and available for everyone. There is also Social Security, which consists primarily the Old-Age, Survivors, and Disability Insurance (OASDI). Most of it consists of pensions. This is a form of life insurance as it insures against the risk of a long life. For orphans there is a survivors insurance. There is also disability insurance for people who cannot work because of disability. Those insurances are also offered in the private sector. Many countries also have health insurance. Workers compensation compensates workers for accidents. Professor Peter Unger wrote a book called Living High and Letting Die: Our Illusion of Innocence. He comes up with an example in which donating $100 to UNICEF will save the lives of thirty children. Professor Unger reports that most people respond strongly that abandoning a wounded hitchhiker is abominable behaviour. He contrasts this near-universal harsh judgement with the lenient judgments most people give to people who do not send $100 to UNICEF . The book gives an analysis for all the excuses people give for not helping poor people in developing nations. A lot of people think that there is nothing they can really do to change things. According to Professor Unger this is one of the rationalisations people give for not being moral. This feeling is based on Malthusian thought. In 1798 Thomas Robert Malthus wrote An Essay on the Principle of Population he wrote: "Population, when unchecked, increases in a geometrical ratio. Subsistence increases only in an arithmetical ratio." He saw an exponential growth of the population and a linear increase in the production of necessities. He then postulated the Dismal Law of Economics indicating that humans will starve . Professor Shiller is an advocate of mathematical finance as well as behavioural finance. Behavioural finance is the application of psychology and other social sciences to finance. Those approaches should be taken together. Many people think that people in finance just want to make money and have little compassion. There is also a feeling that the world is becoming increasingly plutocratic and that the wealthy are controlling the world. This idea is reminiscent of the theories of Karl Marx. The politicial scientists Professor Jacob S. Hacker of Yale University and Professor Paul Pierson of the University of California wrote a book called Winner-Take-All Politics: How Washington Made the Rich Richer and Turned Its Back on the Middle Class. In this book they claim that the world is becoming more polarised by the political power of financial institutions. The book discusses a Thirty Years War of the financial elite against the people of the world by lobbying in the halls of Congress . Professor Hacker and Professor Paul Pierson see the increasing income inequality all over the world, and most notably in the United States, as a consequence of this development. Much of the literature on income inequality attributes this development to the information revolution that is eliminating jobs for low income people, and therefore the increased importance of education. Professor Hacker and Professor Paul Pierson state that the real increase in inequality is not between the educated and the uneducated but is between the top 0.1% and the rest of the population. They state that a small category of super rich is developing that are good at lobbying governments . Professor Shiller thinks that they are right to some extent. Cosmopolitan people know their way in finance. They know how to raise capital and to manage their risks. Inequality is substantially caused by a failure to manage risk. To some extent, inequality is caused by differences in talents. Random events also contribute to inequality, for example a huge drop in home values during the financial crisis. Many people did get into trouble because of this. Most people do not have a lawyer, a financial advisor and an accountant. People in trouble could declare bankruptcy but they need a lawyer. Many people do not take this step so creditors take their money. This is a failure of democratisation in finance. Young people often want to do something important and make a success out of their career and also work on good causes. People have abilities and want to make good use of them. Professor Shiller thinks that people should not just give all their money away but learn things so they can do good works. A perfect career is difficult to define. Bill Gates dropped out of college and founded Microsoft but for most people education is a key to success. Mohammed Yunus had a successful academic career but went to Bangladesh to found the Grameen Bank that specialised in micro finance loans to very low income people. Regular banks were not interested in those loans as the cost of administrating those loans was to high. He devised an alternative scheme by lending money to groups of women who were starting a small business. The women then became jointly responsible for paying back the loan. Young people may expect to work for fifty years and the world will change dramatically during this period. Professor Shiller predicts that technology will change many things in ways we cannot foresee. Financial markets and financial capitalism are the organising principle of human civilisation. Finance is a technology that is moving and changing all the time. There will be profound changes as information technology advances. Professor Shiller sees the democratisation and humanisation of finance as important developments for the future. Democratisation of finance is the application of financial technology for everyone. Humanisation of finance is taking account for human nature in financial planning and the design of financial institutions. Both development can contribute to a better world. There is much concern about rising inequality. Professor Shiller thinks that making finance available for everyone will help to reduce inequality that has nothing to do with effort or skill. Many people think that finance encourages selfish behaviour. With the right organisations and institutions this tendency can be limited. Not everyone is kind and generous but a good society manages aggressive impulses and puts them to good use. The mission of people working in finance is to make the system better in order to get a good outcome out of human qualities and tendencies.